The Labour Day weekend will see the continuation of regular season matches in some Canadian cricket Leagues, but others have some special competitions and finals. The weekend sees the Senior Knock-out competition finals in Montreal for the Quebec league, junior finals for the Toronto and District Cricket Association and a special six-a-side event in Stanley Park, Vancouver for the British Columbia Mainland Cricket League. The Quebec Cricket Federation (La Federation Quebecoise du Cricket) hosts the finals of the three senior divisional Knock-out Cup competitions this weekend in Montreal. The Quebec KO Cup has had a 3-day, two innings per side final in past years, but switches to a best of three one-day matches format this year. Senior Division B: Montreal Caribbean Social Organization (MCSO) v PakCan at Atwater Reservoir, Verdun. The first match in each series is set for Saturday Sept 1, going through to a third match, if necessary, on Monday Sept 3. The finals of the Toronto and District Cricket Association junior competitions at Under-13, Under-15, Under-17 and Under-19 are scheduled for Sunnybrook Park, Toronto, on Monday September 3. Quarter-final and Semi-final matches are also set for Saturday (Sept 1) and Sunday (Sept 2), except in the Under-13 category. North Star CC and the Ontario Cricket Academy have already qualified for the Under-13 final. Play is due to commence at 9am each day. The British Columbia Mainland Cricket League hosts its international six-a-side competition on Monday September 3 in Stanley Park, Vancouver. Play is due to commence at 10.30 am, with matches on the fields of Upper and Lower Brockton. Players from the league play under the banner of their country of origin, such as West Indies, Pakistan, India and Australia. Across on Vancouver Island, the Victoria and District Cricket Association stages a West Indies v The Rest match on Monday at Beacon Hill Park, also drawing on resources from within the local league. Toronto (Aug 30) : The domestic cricket season in several parts of Canada is approaching the climax. Most leagues conclude during September. Some use the regular season standings to determine the champion club, but others have playoffs. In British Columbia and Alberta, league champions from different leagues play-off to decide the provincial champion. Ontario introduced an end-of-season play-off last year. In British Columbia the winner of the Victoria and District Cricket Association (VDCA) plays the winner of the Premier Division of the British Columbia Mainland Cricket League (BCMCL) to decide the Tomalin Cup. Salim Akbar of the BCMCL won last year. The Tahir Cup is awarded in Alberta to the winner of the match between champion clubs of the Calgary and District Cricket League, and the Edmonton and District Cricket League. Predators (CDCL) won last year's Alberta Championship. Young Malton of the Etobicoke & District Cricket League won last year's Ontario Championship playoffs. The John Ross Robertson Trophy is awarded to the Champion amateur club of Canada. However, since 1982 it has been contested in East and West sections with an overall playoff only in certain years. Yorkshire CC (Toronto and District Cricket Association) and Predators (Calgary and District Cricket League) won the East and West sections, respectively, of the John Ross Robertson Trophy in 2007, after winning league titles in 2006. There was a claim that an overall playoff would take place this year, but nothing concrete has transpired to date. Background note: The domestic cricket league standings reflect best available data as at August 30, 2007. An attempt will be made to provide complete league standings, as well as a summary of play-off winners, once the season has ended. The regular season standings in the Weekend League sees Colts (Played 13, won 9) well ahead of Cowichan (Played 13, won 7), Carico (played 13, won 7) and Albion (Played 13, won 6). Colts record of 9 wins in 13 matches results translates into an 81.8% success, with the next three sides having between 53.85% and 50% success. Oak Bay (P 14, W 2, 16.7%) complete the standings. The VDCA also operates a mid-week league, that is entering the play-off phase. Beacon Hill is the signature ground in Victoria, having been used since 1863. Meraloma top the BCMCL Premier Division with a record of 11 wins from 16 matches. This translates into an 84.6% record. Salim Akbar (P 16, W 9, 69.2%) and Richmond (P 17, W 10, 66.7%) follow in second and third places. West Vancouver (P16, W 8, 53.8%) and Pakcan (P16, W 7, 50%) are battling for fourth place. Windies have struggled to a 26.7% record (P17, W 4) with Surrey City floundering with no wins from 16 games. Divisions 1 thru 4 of the BCMCL each has ten teams. Division 5 is split into two conferences, one with ten teams and the other with eight. Ismaili (P 16, W 13, 92.9%) heads Division 1 from Meraloma II (P 16, W 10, 76.9%). Burrard (P 16, W 11, 84.6) is being closely chased by Salim Akbar II (P 16, W 10, 83.3) in Division 2. Richmond IV has a 100% winning record for completed matches in Division 3. Richmond has had three abandoned matches in a record of P 16, W 13, 100%. Arbutus (P 16, W 10, 76.95) is in second place. Division 4 is being hotly contested between Bengal Tigers (P 17, W 11, 73.3), Burrard II (P 17, W 11, 66.9%) and Surrey Stars (P 16, W 8, 66.7%). Surrey Stars II (P 16, W 12, 85.7%) leads Conference A of Division 5 from Abbotsford III (P17, W 12, 75.0%. Fraser Valley Dragons II (P16, W 12, 80.0%) leads Brockton Point III (P 16, W 10, 71.4%) in Conference B.
CanAsia (P 9, W 6, 36 points) and St John’s (P 10, W 6, Pts 36) head the seven team Premier Division in Calgary, followed by Predators (P 9, W 5, Pts 33) and Crown (P 9, W 5, Pts 33). Cavaliers I (P 9, W3 , Pts 18) and United (P , W3 , Pts 18) are contesting 5th place. Cavaliers II foot the division with just 1 win and 6 points from 9 games. Predators won the league in 2006. Blackhawks (P 9, W 6, Pts 36) top the six team Division One from Star XI (P 8, W 4, Pts 24). Division Two has 7 teams, lead by Pearson Patriots (P 10, W 7, Pts 42) and Glenmore (P 11, W 6, Pts 36). Riley Park has been the home of Calgarian cricket since 1908. Positions in this league are determined by average points per game. Victoria Park (P 11, W 7, Ave 4.20) top the league, followed by Elites (P 11, W 6, Ave 4.00). Millwoods are third (P 11, W 5, Ave 3.33) and Gujarat (P11, W 5, Ave 3.00). Completing the 7-team Premier Division are Edmonton CC (P 11, W 4, Ave 2.40), Scona (P 10, W 3, Ave 2.0) and Greenfield (P 11, W 3, Ave 2.0). Zain Ahmed, named in Canada's squad to play in Kenya and Namibia in October, heads the batting averages with 277 runs from 6 completed innings at an average of 46.17 runs per innings. Rising Stars heads the seven team First Division, followed by Edmonton 'B', Combined Schools and Spartans. Rising Stars has won 9 of 11 games. The subsequent trio each has 6 wins from 11 matches. Saskatoon CC won 3 of its 4 league games, losing once to PCCR. Results of matches between the Regina-based PCCR and ICCC are not at hand. Pakistan (P 7, W 5, Pts 40) and India XI (P 6, W 5, Pts 40) lead the MCA Division 1. Winnipeg Juniors (P 7, W 4, Pts 32) and Lions (P 6, W 4, Pts 32) are battling for third place in the regular standings. Cosmos and All India have both gained 24 points via 3 wins from 6 games. Pakistan II are in 7th place (P 7, W 2, Pts 16) with Bloomfield in the basement (P 7, W 0, Pts 0). Division Two is lead by Seahawks (P 7, W 5, Pts 40) from Bengal Tigers (P 6, W 4, Pts 32), Bharat (P 6, W 3, Pts 24) and Manitoba Cricket Association Under-19's (P 7, W 3, Pts 24). Lions II and Eldorado complete this division. Both has a record of P 6, W 2, Pts 16. The Toronto and District Premier Division comprises twelve teams divided into two conferences. Leading the Pompey Conference are Toronto CC (P 15, W 10, Pts 66), Overseas (P 15, W 9, Pts 57), Brampton Masters (P 12, W 7, Pts 52) and Cavaliers (P 13, W 6, Pts 45). Victoria Park (P 12, W 2, 27 pts) and West Indian CC (P 12, W 3, 24 pts) complete this section. Yorkshire (P 14, W 9, Pts 54) and Vikings (P 14, W 7, Pts 54) are challenging for top spot in the Ward Conference, ahead of Centurions (P 14, W 6, Pts 49). Canada Under23 (P 14, W 2, Pts 21), Malton (P 12, W 2, Pts 18) and Grace Church (P 13, W 2, Pts 15) complete this conference. Premier Division matches are scheduled for Maple Leaf CC (King City) and G Ross Lord Park (Toronto) over the coming Labour Day weekend on Saturday, Sunday and Monday (Sept 3). T&DCA Division 1 has four conferences, each with 6 teams. Division Two has two conferences, each with 9 clubs and Division Three has four conferences, each with 8 teams. Calypso (P 11, W 9, Pts 101). Brampton United (P 13, W 7, Pts 88) are third, well ahead of United (P 13, W 4, Pts 57), KVSS (P 13, W 3, Pts 38) and York Central (P 10, W 2, Pts 26). Elmbank (P 11, W 6, Pts 83) leads the Morgan Conference from Malton Sports Club (P 11, W 6, Pts 78). BSCC (P10, W6) and GTSC (P 12,W 6) each has 70 points. Bramalea is 5th (P 12 W 5, Pts 63) with PCA in bottom place (P 10, W 1, Pts 12 ). Divisions One thru Four of the Etobicoke and District Cricket League each has two conferences of 6 teams. Division Five has one conference of seven clubs and one with six clubs. Crescent (P 7, W 7, Pts 70) leads the Hamilton and District Cricket League from St Catherines (P 8, W 6, Pts 60). Hamilton CC is in third spot (P 7, W 3, Pts 30). The top four teams in the standings go on to the semi-finals (September 8th). The final spot would go to one of Mississauga Ramblers (P 6, W 1, Pts 15), Cambridge (P5 W 1 Pts 15) or Brantford (P7, W 1, Pts 10). The play-off final is due on Sunday September 9th. Waterloo Sunrise Browne was due to play either Cavaliers or Kaiteur in the Southern Ontario Cricket Association championship on August 25. Windsor YCC (P 9, W 3, Pts 28) round out the active teams. There seems to be mixed success in this league. The top three teams have good playing records, Waterloo Sunrise is thriving with two teams in the SOCA league, but the new Islanders team from London (Ontario) and Cambridge Sports have defaulted on most matches. The Cambridge side shows one win from ten matches, a walkover against Islanders. Islanders have no points from 9 matches. The SOCA season ends with a 20/20 competition on the weekend of September 8th and 9th. A Knock-out Cup takes place, with quarter-finals on September 15th, semi-finals on September 16th and the final on September 22nd. The main league championship is the Challenge Cup, which has 7 teams. Most teams are in the Ottawa area with one outlying club in Kingston. Defence (P 10, W 7, Pts 36) top the standings. They are followed by New Edinburgh (P 10, W 7, Pts 32), Christ Church Cathedral (P 8 , W 3, Pts 17), Kingston (P 11, W 3, Pts 15) Exodus-BelAir (P 9, W 2, Pts 12), and Ottawa (P 11, W 1, Pts 7). The Final of the Challenge Cup is scheduled for September 23rd. The Knock-out Cup Final rounds off the season in the Ottawa Valley on September 29th. Eight teams compete in the Grade B Citizen (Trophy). Exodus-Belair B (P 12, W 10, Pts 40) heads Defence (P12, W 8, Pts 32) and Canterbury (P 12, W 7, Pts 30). The eight teams in this division include Ottawa Valley CC Juniors. Rideau Hall is the ground at the traditional heart of cricket in the Ottawa area. It is also home to the Governor-General of Canada. The regular season in the Canadian Commonwealth C.A. is set to end on Septermber 16. Six teams progress to the playoffs in each of the three divisions. Jays Auto (P 14, W 8, Pts 96) leads Heritage (P 14, W 7, Pts 91) at the top of the Premier Division. Three teams follow in the standings with between 77 and 79 points (Windies SC 79 pts, Georgetown 78 pts and Apollo 77 pts). Apollo (P 12, W 6, Pts 77) has two games in hard over Windies and Georgetown. Guyanese SC (P 12, W 5 Pts 67) and La Club Sports (P 13, W 5, Pts 67) are still in the hunt for a playoff sport. CriAsiaBEffort (P 13, W 3, Pts 44) seem out of contention. The First Division is divided into two conferences, each with six teams. Brampton Masters (P13, W 10, Pts 111) leads the Hanraj Conference from Avengers/Indo-Pak CC (P 12, W 7, Pts 82). Stallions XI (P 12, W 7, Pts 84) and Falcon21 (P 12, W 7, Pts 78) top the Ross Conference. Etobicoke Eagles (P 17, W 12, Pts 139) leads the seven-team Second Division from Stallions/Atlantic CC (P 15, W 11, Pts 128) and MCC CC (P 17, W 11, Pts 124). The ten team Premier Division is divided into two five-team conferences. Scarborough CC (P 11, W 7, Pts 51) leads Lawrence CC (P 10 W 5, Pts 40) in one conference, with B4U East-West (P 10, W 7, Pts 63) ahead of Bawa XI (P10, W 7, Pts 52) in the other. The Premier regular season wraps up on September 9. Youngstar (P12, W 9, Pts 66) leads Gujarat/Baroda (P10, W 6, Pts 55) in one of the two Division One conferences. APM CC (P11, W 7, Pts 55) leading B4U/East-West B (P9, W 5, Pts 41) in the other conference. Toronto Knights (P 10, W 6, Pts 49) leads its conference in Division Two, followed by Falcons (P 9, W 4, Pts 33). Star CC (P11, W 9, Pts 66) has a big lead over IMS (P 11, W 5, Pts 45) in the other section of Division Two. Division One has ten clubs. Division Two has eleven. Adastrians (P 12, W 10) and PakCan (P12, W10) are battling for the Premier Division championship in Quebec, just ahead of AAT Sports Club (P 12 W9, 1 Abandoned match). There are four more rounds of league matches to play. The final rounds of League matches in the Premier Division are set for Saturday September 15th and Sunday September 16th. The Senior Divisions A and B conclude the following weekend. The Knockout Cup Final is set for Labour Day weekend (Sept 1-3). The Premier Division version has previously been played as a 3-day match, but this year changes to a best of 3 one-day games series. Four teams from these eastern Canadian Provinces play competitive matches, according to information previously received. The highlight of the coming season will be, of course, the coming of the MCC in July, August, and September, for a six week stay during which time they will play a series of matches across the country, commencing in Montreal, Quebec, and ending in London, Ontario. This will be the third visit to Canada by an MCC team in recent times. We entertained a side under the captaincy of G.M. Newmam in 1937, and one captained by R.M.V. Robins in 1951. Now, after an eight year lapse, we look forward again to the pleasure of entertaining a team from the cradle of cricket. The benefits to Canadian cricketers of visits from the MCC are, of course, too numerious to warrant discussion in these few paragraphs. We found after the 1951 Tour undertaken by Walter Robins' team that new enthusiasms grew; that those who had thirsted so long for first class cricket crowed with exultation when they were given an opportunity to see it once more and asked eagerly when it might be seen again; that our players were given an opportunity to profit from the experience they had gained, experience all too rarely come by in this country where the game is strictly amateur and funds to finance it are, generally speaking, at a low ebb. Everyone likes to improve his game and it is old history hownb it follows that one's own game will improve if one plays against better and straonger opposition and will fain profit from what onbe learns from the experience. Many of our leading players will benefit very greatly from the experience they will again when the MCC play hear this year. We welcome them with open arms and hope they will enjoy their stay amongst us. After a series of matches in the East, namely Montreal. Ottawa, Toronto, St.Catherines, and Hamilton, the MCC will fly to Vancouver where they will play four matches plus single games in Victoria and Trail. From British Columbia the MCC proceed to Alberta where they will play two matches in Calgary and Edmonton before heading east to Winnipeg where they have an engagement, following which they proceed back to Toronto. In that city a tree day "Test" match will be held between a representative Canadain sise and the MCC, and this will be the big opportunity for our local players to pit their skills against visitors who are masters of their craft. From Toronto the MCC go to Guelph and London for single games and then depart for the United States and matches in Philadelphia (or New York) and Washington. In June the second Canadian Junior Touring Team will visit the United Kingdom where they will play a series of sixteen matches against public school opposition. This is part of a plan put into operation by the Canadain Cricket Association in 1957 when a junior side spent six weeks in England and met similar opposition. Junior cricket is very much in the minds of the Board of Control and, at the Annual General Meeting of the Canadian Cricket Association in 1958, it was decided to foster a five year plan for Junior Canadian cricketers whereby they would be given their game and receive the basic coaching which is so important in the formative years of any cricketer. Part of the five year plan involved the visit of the first Junior side to England. The tour was a complete success as was the Junior Inter-Provincial Tournament held in Winnipeg, Manitoba, in 1958, which followed it. As a result of the success which attended the first two ventures conceived as part of the aforementioned Junior Cricket program, the Tour of England by a junior side in 1959 was decided upon, thanks to the encouragement given by the CCA by the MCC under whose auspices the current tour is being arranged. It is expected that 14 Canadian boys will visit the United Kingdon and, as part of the progress arranged on their behalf, they will receive coaching at Lord's in the early part of the tour. A visit to Canada by the Australian Old Collegians team, recruited from the unversity and college students in the Sate of Victoria, which will visit most of cricketitng countries of the world between May and Octobver, 1959, will provide unique and welome opposition for teams drawn from players available in Toronto, Calgary, and Vancouver, in August. The Australians, including some well known ex-Sheffield Shield players in their number, will play two matches in Toronto and one each in Calgary and Vancouver. They will be wlecomed eagerly in these cities as it is all too rarely that a team from the great cricketing country of Australia visits our shores. One has to cast one's mind back to the summer 0f 1932, when A.A. Mailey brought his representative Australian team to tour Canada, which marks the last occasion on which we were able to entertain a side from the Antipodes in our midst. The revival of cricket in the Province of Saskatchewan in the late summer of 1958 was one of the most welcome developments, domestically speaking, in recent years. No cricket had been played in the Wheat Province since 1941 prior to the aforementioned resurgence last summer. Games have been planned for Regina teams in Winnipeg and Calgary and the addition of a team at Weyburn, in south eastern Saskatchewan last summer, has meant that regular matches will now be possible in that Provinnce. Last summer was noteworthy, in addition, for the revival of the game of cricket in the Lakehead area of Ontario and also in the south of Alberta, where two teams are about to commence operations in Lethbridge. These Alberta sides will be able to enjoy an inter-locking series of matches with clubs participating in the Calgary and District Cricket League. The Lakehead clubs, two in number, will make a trip to Winnipeg over a long weekend in 1959. There is no doubt but that 1959 will represent one of the fullest seasons which we shall have enjoyed in ths country in many years. Junior activity has spread from the West Coast to Alberta and Manitoba, and junior sides will be operating under adult coaches in each of these three Provinces this summer. Plans are being laid for a team from Milwaukee to visit Winnipeg, there will regular interchange of visits between sides from Victoria to Vancouver, on both senior and junior level, between other centres on perhaps a rather less frequent basis. The portends for cricket in 1959 remains excellent. At all events it will be a year of developments, challenge and interest, at the end of which Canadain cricketers will be able to take stock of the situation and assess the degree of benefit they have obtained from the varied program which will have taken place for their edification. Article composed and written by Donald King - Secretary CCA, and transcribed from the 48 pages booklet "CANADIAN CRICKET ASSOCIATION 1959", by Jon Harris. "In other words, the Asian Cricket Council, with around 20% of the ICC’s Associate and Affiliate members, received nearly two-thirds of the money allocated to the Global Development Programme, while Europe, with nearly 30% of the members, got 12% of the funding. I know those figures are right, because I was so gob-smacked that I worked them out three times to make sure. So not only is the cake itself too small – although $13m., or even $7.1m., isn’t to be sneezed at – but the slicing of the cake is so inequitable that it beggars belief. It’s hard to see how such a pattern of distribution can be justified. It can’t be based on the numbers of players in the Associate and Affiliate countries, because on the latest figures I have seen Asia ranked fourth on that criterion, after Africa, Europe and America." The first ICC Americas Women's Championship ended on a celebratory note with a match between a select Americas XI and the Trinidad & Tobago Under-17 team, as well as two 20/20 matches between mixed teams comprising players from Canada, Bermuda and Argentina who took part in the tournament. In the show match of the day, T&T recorded a comfortable five-wicket win over the Americas XI, knocking off the required 186 in only 35.5 overs. The Americas XI had compiled a useful 185 for 7 in their 50 overs after being sent in, but this ultimately proved to be nowhere near enough to challenge their youthful opponents. The Americas XI batting line-up performed solidly, but could never quite pick up the tempo and gain some momentum until late in the innings against the disciplined and tidy Trinidad & Tobago bowlers and fielders. It was finally thanks to a great partnership between the two form players of the tournament, Terry-Lynn Paynter (Bermuda), who made an undefeated 55, with seven fours, and player of the tournament, Joanna White (Canada), who made 40. The pair added 86 for the sixth wicket after the Americas team had been reduced to 83 for 5. Gaitri Seetahal shone with 3 for 26 in 10 overs, as did Whitney Cudjoe, who grabbed 1 for 15 in five. In reply, an almost faultless opening stand of 103, between player of the match Cudjoe (62) and Rachael Marcano (30) virtually sealed the result. Although Americas used a variety of bowlers to try to reverse the T&T dominance, the opening pair stood firm in a fine century partnership. Reuna Richardson, who finished with 2 for 15 off 4.5 overs, and Veronica Vasquez, 1 for 14, eventually made the breakthroughs, but Amanda Samaroo, (23*) and Gaitri Seetahal (26*) took them to a deserved victory. There was a festival atmosphere on the adjacent ground as the remaining players involved in the tournament joined together to play two entertaining 20/20 matches, where fine displays from Dirce Yuli of Argentina, and Canadian Helene Gaffney, earned them respective player of the match awards. So Canada claim the first ever ICC Americas Women's Championship title, and certainly there is huge optimism for the future of women's cricket in the region after an enormously successful tournament. The 1977 season was an unusually successful one for Canadian cricket. The scope of activities at the National level and at the Provincial level continued to grow, while in actual competition, Canada performed better at both the Junior and Senior levels than ever before. In July the first National Under-17 Tournament was held in Victoria, British Columbia, under the guidance of Jack Kyle, the National Junior Cricket Coordinator. He was ably assisted by Peter Spence, the New South Wales Director of Coaching and coaches from each of the participating provinces. Four teams -- British Columbia, Alberta, Ontario and Eastern Provinces -- participated, Ontario winning the Championship. The National Junior (Under 19) side toured the U.K. for three weeks in July before participating in the Second International Youth Festival at Charterhouse School. The tour was one of the most successful ever undertaken by a Junior side. The side, led by Martin Stead (B.C. ), won six, drew five, and lost once. In the International Youth Festival Canada won three and lost two, tieing with England South and Denmark in wins and losses, but were placed third on a lower runs-per-wicket average. Denmark were placed fourth, Ireland fifth, and Holland sixth. English North finished first, undefeated. The next tournament is scheduled to take place at Upper Canada College in Toronto, in 1979. At the Senior level, the National Championship was held in Toronto at Upper Canada College from July 31 to August 6. All seven cricket-playing provinces participated as they did in 1975 at Calgary. All players and officials were housed at the College where all the matches were played. With three good pitches available, all of which were matting on shale, plus the fact that the weather was excellent all week, it was no surprise that a fine week of cricket was enjoyed by all. It was the first National Championship to be played on an overs basis (50 overs per innings). The reason for changing from time was to give the best players in the country more exposure to this form of cricket in preparation for the World Cup in 1979. Ontario, unbeaten, retained the Championship with six wins, but met tough competition from both Alberta and British Columbia. The latter team almost caused the major upset of the week in Ontario's last match. Quebec were runners-up with five wins and one loss. The top bowler of the week was Jitu Patel, Canada's top spinner from London, Ontario, while John Corbin, a very promising 21-year-old from Montreal, Quebec, won the batting Championship. Pip Robins of British Columbia won the fielding award for the second successive Championship. It was surprising that clubs found it possible to carry on with the John Ross Robertson Trophy competition for the National Club Championship despite the fact that there was no financial assistance from the Federal Government. In 1977 the Federal Government funds went to assist the National Junior tour in the U.K. and the National Senior Championship in Toronto. League champions representing their province competing in 1977 were as follows: Victoria Alcos, British Columbia; Edmonton Sportsmen, Alberta; Regina, Saskatchewan; Winnipeg Eagles, Manitoba; Toronto Cricket, Skating and Curling Club, Ontario; Montreal West Indies, Quebec; and Halifax, Nova Scotia. Victoria Alcos lost to Edmonton Sportsmen, while Winnipeg defeated Regina. Edmonton then won the Western title. In the east Quebec went to Halifax to defeat the Nova Scotia champions, then defeated the Toronto Cricket, Skating and Curling Club, the cup holders, in a match marked by controversy. Edmonton Sportsmen journeyed over 2,000 miles to Montreal only to lose to the West Indian Cricket Club who became the 1977 Canadian Club champions. Coaching on a National scale was continued in 1977 when the Canadian Cricket Association hired Peter Spence, the New South Wales Director of Coaching. He visited most major cities conducting clinics for coaches, ending his visit in Victoria at the National Under-17 tournament. Professor J. W. Cole, President of the Canadian Cricket Association, attended the I.C.C. meeting in July and was also present at a number of the matches played in the International Youth Festival. The Association suffered a grievous loss in the death of Donald King, C.M., M.B.E., on October 2, 1977. He had not been well for some time but was present at the National Tournament in August. He served the Canadian Cricket Association for over twenty years, mainly as Secretary. Stone helped organize the Vradenburg Cricket Festival that was held at Vradenburg Junior Public School at Warden and Finch avenues on Wednesday. Grade 4, 5 and 6 students from Cornell Public School at Markham Road and Lawrence Avenue and North York's Grenoble Public School at Don Mills Road and Eglinton Avenue were invited to compete. Publisher Comments: The fun and easy way to understand the fine points of cricket– and play to win! From the United Kingdom to the British Commonwealth (including Australia, New Zealand, India, Pakistan, South Africa, and many Caribbean nations) to immigrant communities across North America, cricket is an extraordinarily popular sport. But for those unfamiliar with the game, the rules and jargon of cricket can seem baffling. This friendly guide demystifies the sport, explaining the arcane rules, defining idiosyncratic terms such as " silly point" and " late cuts, " and describing the skills, equipment, and tactics people need to start playing– and winning– the game. Complete with a tour of the international cricketing scene, Cricket For Dummies is a must-have reference for fans of the sport and would-be bowlers and batsmen everywhere. Julian Knight (UK) is a BBC journalist, writer, and cricket enthusiast. A club cricketer for over 20 years, he has captained two national championship teams. Whether you're a budding player or aspiring armchair expert, Cricket For Dummies will help you get to grips with this fascinating sport. Inside you'll find an outline of the game's laws plus in-depth advice on improving your playing techniques and tactics. You'll also discover the tournaments, global rivalries, and great players that make today's game so compelling. Whether you’ re a weekend cricketer or aspiring armchair expert, "Cricket For Dummies" helps you make sense of this fascinating sport. Not just a jargon busting guide to cricket’ s laws, techniques and tactics, it also contains advice on kitting yourself out and provides lessons on playing the game and improving your batting, bowling and fielding skills. For the budding fan, there’ s a guide to the greatest players, the memorable matches, and a tour through the cricketing scene – both domestic and international – giving you the knowledge you need to fully appreciate this special game. Julian Knight is a BBC journalist, writer, and cricket enthusiast. He is a former youth coach and captain, and has been a club cricketer for over 20 years. Consultant Editor Gary Palmer played first class cricket for ten years with Somerset before becoming a professional coach. Toronto, Ontario (Aug 25): The ICC Americas Womens' Championship concluded on Friday (August 24) with Trinidad & Tobago Under-17's beating the Americas XI by 5 wickets. The Americas scored 185 runs in 50 overs, losing 7 wickets. Bermuda's Terry-Lynn Paynter, with 55 runs not out, and Canada's Joanna White, with 40 runs, steered the Americas batting to a respectable total. The powerful Trinidad batting line-up, headed by an innings of 62 runs from Whitney Cudjoe, secured victory in the 36th over. Trinidad made 186 runs for the loss of 5 wickets. Amanda Samaroo, Trinidad's batting star in exhibition games against Argentina, Bermuda and Canada, did not bat in this match. Samaroo took the individual batting award at the tournament's closing presentations. Bermuda's Paynter won the bowling award and Canada's White, based on Vancouver Island, British Columbia, won the prestigious Player of the Tournament award. The presentations concluded with Canada's Ave Morgan receiving the Americas Womens' Championship trophy from Anne Browne-John, a former Trinidad and West Indies international. Browne-John, together with Martin Viera and Grant Dugmore of ICC Americas Development, helped make this tournament a reality. Canada lost a close series of Women's World Cup qualifying matches 2-1 to Bermuda in September 2006. Winning the inaugural title is a fine reward for Canadian captain Ave Mogan's efforts to build women's cricket. Canadian Coach Tony Cordle did a fine job in blending players from Vancouver Island and the Greater Toronto Area together in a short time. He proudly lead the singing of 'O Canada' following the win over Bermuda on Wednesday. This tournament has set the ball rolling for Associate and Affiliate countries in the Americas Region. The players were delighted to scream 'Yes' when asked 'Did you have fun?' by both Dugmore and Viera. It was fun. It was cricket played in the true spirit. It was the cricket without boundaries/borders that ICC's Global Development program envisages. Two 20/20 matches were also staged on Friday between players not involved in the Trinidad-Americas XI game. The First West Indies Cricket Tour – Canada and the United States in 1886 Edited and with an introduction by Hilary McD Beckles with The Tour of the West Indian Cricketers August and September, 1886, gives cricket lovers a clear synopsis of the tour of the West Indian cricketers August and September, 1886. Hilary McD Beckles is Pro Vice Chancellor and Principal, and Professor of Economic and Social History, University of the West Indies, Cave Hill, Barbados. He has published extensively on West Indian history, women and slavery and West Indian cricket history. The book includes a vivid memory by one of the cricketers LR Fyfe that gives a clear connection between North America and the development of cricket in the West Indies. The historical context of the book is remarkable. The description of the tour’s social and historical significance adds immeasurably to the appreciation of the diary and enhances its appeal as a delightful journey and ball by ball account from so many years ago. It is not generally known that the West Indies cricket team, formed in 1884, made its first overseas tour two years later to Canada and the United States. The tourists played thirteen matches during August and September; they won six, lost five and two were drawn. The first match was played against the Montreal Cricket Club in August 1886. It ended in a draw after which the West Indians moved on to Ottawa, Toronto and Hamilton. They arrived in the United States to play a number of matches in Philadelphia where the cricket culture was well established. Local clubs proved too strong an opposition for the tourists. The press was encouraging but made it clear that the islanders were out of their depth. It was an important tour for the West Indies cricketers. It was the first international step in an apprenticeship that lasted decades. The English decided, finally to host the West Indians in 1900. This book speaks to the Canadian and American beginning of the West Indians cricket culture that was to emerge a century later as the most powerful performance force the game has ever seen. The book has been launched in Jamaica and Trinidad and Tobago, and was launched in Barbados and Guyana over the course of the ICC Cricket World Cup 2007. The book is currently available at the bookstore at the University of the West Indies in St Augustine. Professor Anthony Littlewood of the University of Western Ontario is undertaking the onerous project of producing a review of The First West Indies Cricket Tour – Canada and the United States in 1886. Four members of the Canadian women's cricket team that won the inagural ICC Americas Championship on Wednesday are named in the Americas XI for Friday's closing exhibition match. The enterprising Trinidad and Tobago Under-17 side is the opposition. Joanna White and Kim Coulter, who added 123 runs for Canada's third wicket in the pivotal win over Bermuda, are joined by skipper Ave Morgan and Maree Wilson. Four Bermudian, two Argentinian and two other Americas invitees complete the squad. Trinidad & Tobago Under-19's won all three exhibition matches against Canada, Bermuda and Argentina. Amanda Samaroo complied a masterly innings of 128 runs on Wednesday, as T&T piled up 333 runs for 3 wickets in 40 overs. Whitney Cudjoe made 55 runs. Samaroo's knock included 14 boundaries and was made off just 125 balls. Argentina showed great determination in batting out the full 40 overs in its first overseas trip. The side came close to breaking the century mark again, but did not quite make it, ending on 92 runs for 4 wickets. Thus, T&T won by 333 runs. The match is to be played at Maple Leaf Cricket Club, King City, Ontario. All are welcome and admission is free. A second match between remaining members of the Argentina, Bermudian and Canadian squads is also scheduled. Tournament presentations are due to follow these matches. Ave Mogan (capt), Joanna White, Kim Coulter, Maree Wilson (all Canada), Chevonne Furbert (v-capt), Terry-Lynn Paynter, Reuna Richardson, Wendy Woodley (all Bermuda), Veronica Vasquez, Cecilia Birnie (both Argentina), Mawhish Khan and Santhiya Rajaram (ICC Americas invitees). Bermuda won the toss and elected to bat. King City, Ontario (Aug 22): Canada’s women won the inaugural ICC Americas Womens Championship thanks to a 5 wicket win over Bermuda. After winning the toss, Canada kept the Bermudian scoring under control until the later stages of the innings. Terry-Lynn Paynter spearheaded the batting with 58 runs but had limited support from her teammates. Four other Bermudians reached double figures. Britney Marshall reached 17 runs before being run out and opening bat Linda Mienzer’s innings ended when retiring hurt on 11 runs. Three Canadian bowlers kept the opposition run rate under control. Joanna White and Meara Crawford each bowled 8 overs for just 26 runs. Captain Ave Mogan took 1 wicket for 24 runs in 7 overs. Helene Gaffney took 3 wickets in 4 overs, but conceded 31 runs. Canada lost two wickets, including Mogan for 10 runs, early in its innings. Kim Coulter batted well and ran well between the wickets. This kept the score ticking along, especially as her main partner, Joanna White, began to stoke the ball well around the ground. The pair posted the first century stand in Canadian Women’s cricket history when the score reached 123 runs for 2 wickets. Coulter’s sound innings ended when leg-before wicket to Stacy Babb for 37 runs. Two wickets quickly followed before White reached 50 runs not out, and Canada reached 173 runs for 5 wickets at the end of 35 overs. Bermuda gave away 49 runs from wides. Coach Tony Cordle deserves great credit for his efforts. The whole squad was happy and singing in the post-game exercises. The Trinidad & Tobago Under-17 women posted a big win over Argentina. The T&T side won all three matches against the ICC Associate countries in the Americas tournament. On Friday, this team will play the Americas XI. This match begins at 10.30 am at the Maple Leaf Cricket Club, King City. Admission is free. Trinidad & Tobago Under-17 side pulled off a good 64-run win against Bermuda. T&T chose to bat and made a useful 173 all out. The opener Whitney Cudjoe made an excellent 47 from 64 balls. Important contributions also came from middle-order batters Alison Collins, with 22, and captain Jerveena Pollucksingh, who made 28. Offspinner Brittney Marshall took 3 for 20 for Bermuda, including a stunning return catch to dismiss Pollucksingh. Linda Mienzer also bowled well for 2 for 33 off her 8 overs. The Bermuda reply was highlighted by a lack of meaningful partnerships, with wickets falling at regular intervals, despite a brief threat when player-of-the-match Marshall struck a quick 25 off 31 balls with five powerful fours. Of the rest of the Bermudan batters, only skipper Chevonne Furbert reached double figures, making a late 15 in 18 balls with 2 fours. The other highlight was three brilliant run-outs, all with direct hits; two by Amanda Samaroo and another by Melissa Sandy. In the end, Bermuda were all out for 109 in 33.1 overs, 64 runs short. The T&T coach Brenda Solozano, was understandably pleased with the performance of her young team. "They were excellent today, achieving a good win against a good team, and we will continue to strive for excellence in the games ahead." In the other game, Canada encountered little resistance from Argentina in their Americas Women's Championship match in Toronto, winning by a comfortable eight wicketsand they will now play Bermuda on Wednesday. Allrounder Joanna White starred with both bat and ball, helping to bowl out Argentina for 108 in 34.1 overs, with 3 for 14. Then, with Canada's reply at a crossroad at 31 for 2, she struck a superb unbeaten 34 from only 33 balls to help steer Canada home in the 17th over. She and opener Shoba Singh (35*) shared an unbeaten 81-run stand. A young and inexperienced Argentina can be proud of another spirited performance. At one point they were well placed at 82 for 3 after 24 overs, with fine contributions coming from Marcela Rojas, with 27, and Veronica Vasquez, with 18. However, White and Helene Gaffney (2 for 18) helped to dismiss the last seven Argentine wickets for 26 -and 108 was never going to be enough. Tournament organisers have brought Thursday's fixtures forward to Wednesday, because thunderstorms have been predicted for Thursday and Friday. Canada’s women cricketers beat Argentina by 8 wickets on Tuesday in the ICC Americas Regional Championships. Argentina made 108 all out (32.3 overs), breaking the century mark for the second game in a row, which is commendable for an emerging team. The Argentine bowlers had some early success, but Yvette Singh, with 35 runs not out, and Joanna White, 34 runs not out, powered Canada to victory in the 17th over. Canada made 112 runs for 2 wickets. In the Argentina innings, White bowled economically and successfully, taking 3 wickets for 14 runs in 7.1 overs. Helene Gaffney (2 wickets for 18 runs in 8 overs) and Meara Crawford (1 wicket for 19 runs in 8 overs) also bowled well. Marcela Rojas made 27 runs and Veronica Vasquez 18 runs for the South Americans. Trinidad & Tobago registered its second win when defeating Bermuda by 64 runs. Trinidad scored 173 runs all out in 39.4 overs), lead by Whitney Cudjoe’s 47 runs and Jerveena Pollicksingh’s 28 runs. Britney Marshall was the most successful Bermudian bowler, taking 3 wickets for 20 runs in 6 overs. Bermuda had a fits and starts innings, with only Marshall making it past the twenty run mark. She scored 25 runs. Chevonne Fubert was the next highest scorer but was one of three players to be run out in the later stages of the Bermudian innings. Six bowlers shared the other seven wickets. Alice Collins took the wickets of Marshall and Rickelle Smith, who made 10 runs. Thunderstorms are predicted for Thursday and Friday, so team managers have opted to play the third and final round-robin games on Wednesday. Trinidad should account for Argentina, and thus go undefeated in the tournament. The battle for second place between Canada and Bermuda (both with a record of 1 win and 1 defeat) features the two leading Associate countries in the Americas region. The Canadians will hope to avenge a 2-1 series loss to Bermuda last year that put Canada out of the hunt for a place in the next Women’s World Cricket Cup. Play is scheduled to commence at 10.30 am at Maple Leaf Cricket Club, King City, Ontario. Admission is free. The sun is due to make an appearance, which will make a change after a rather cold and windy day on Tuesday. Trinidad and Tobago’s women’s cricket team beat Canada’s women by 7 wickets on the opening day of the International Cricket Council Americas Regional Tournament on Monday August 20. Bermuda marched to an expected victory over Argentina by 143 euns. However, Argentina did well in making a total of 132 runs in its first overseas excursion. The teams encountered a stiff east-west wind at the Maple Leaf Cricket Club grounds north of the Greater Toronto Area. For some of the players it was a rare appearance on a grass wicket. The aim of the tournament, and the preceding training sessions organized by the ICC, is to foster the development of the game on a more global basis. The hope is that players and teams progress as this week unfolds. Further round-robin games will be played on Tuesday and Thursday from10.30 am start. Trinidad plays a select Americas Development XI on Friday and remaining players play as Rest of Americas ‘A’ v B’. Thursday’s Canada-Bermuda game is pivotal for the host country. Bermuda won a series 2-1 in Victoria last September to advance in qualification for the next Women’s World Cup. Canada is keen for a win over the Bermudians. Canada was put in to bat by Trinidad. Progress was steady rather than spectacular, and the coaches hope to see players in future matches keeping the scoreboard moving by scoring the vital 1’s and 2’s. Minimizing ‘dot balls’ (ones where no run is scored) is key in limited overs. Thanks to two innings of 34 runs, by top order batsperson Kim Coulter and Jeanna White in the lower order, Canada reached 165 runs for the loss of 7 wickets in 40 overs. Trinidad’s innings saw a steady stream of runs after the loss of an early wicket. Amanda Cudjoe, batting at number three, was the main destroyer of the Canadian attack, although several wides aided the visitors cause. Key breakthroughs were not achieved, and the later bowlers were not able to restrict the run flow. Trinidad reached a winning 167 runs for the loss of just 3 wickets in the 32nd over. The Canadian side is a mix of players from British Columbia and Ontario, with Tony Cordle, a highly experienced player with Glamorgan on the County Championship circuit back in England and Wales, acting as coach. It can be tough going for the coaches at this level as they attempt to push players towards a greater understanding of sticking to the basics of the game. It is relatively easy to tell someone to play down the line of the ball when batting, or to bowl a tight line towards the off-stump that restricts opponents run scoring or to field and catch to a satisfactory level. To see it implemented is another matter!This applies not just in women’s cricket. Leading coaches at the 2007 Cricket World Cup in the West Indies were preaching similar messages. If people brought up in a country or region with a major cricketing culture have trouble implementing the basics from time to time, just imagine the situation for players with little cricket experience or culture. Bermuda was expected to beat the emerging Argentina women in this encounter, and they duly posted a win. Runs flowed from the opening overs as opening bats Linda Mienzer and Wendy Woodley scored 30 runs and 23 runs respectively. Reuna Richardson played the dominant innings of the game falling 4 runs short of a century. Catalina Grenoli took a creditable 3 wickets for 40 runs in 8 overs for Argentina. The early batting struggled for the South Americans, with Terry Lynn Paynter making early inroads en-route to a final 5 wickets for 27 runs. Delfina Canton top-scored with 36 runs and Georgina Retamales helped with a creditable 23 runs. Argentina was eventually all out for 132 runs at the end of the 29th over. Words fail regarding a protracted discussion that lead to play ceasing in this match and the covers being put in place during a few spots of rain. Play continued without a thought of interruption in the Canada-Trinidad encounter. The decision to play or not to play rests with the specific umpires, and people opinions can clearly differ. How do players gain international developmental experience while the pitch is covered? I wIll be back at the ground tomorrow, but if there are only two designated groundstaff to take off the overnight pitch coverings, I can guarantee I will not be waiting for the ground gates to open so I can help the process again. My feelings are for the ground-staff, the players, most of the umpires and the almost extinct coaching community. I would welcome one of the Vice-Presidents and upwards layers of the CCA Executive to articulate which CCA officer, or designate, was responsible for each of the home international matches at senior, junior and women’s levels this season. A valiant few in Canadian cricket are pressing for improved playing and facility standards, as well as promoting the sport. The CCA President was happy to pose in a team photo for the CEO team that was to meet the Toronto Mayor’s XI at a reception earlier this summer. He then failed to take his place on the field when the CEO’s team played in the CIMA Celebrity Cricket match on the Saturday. Some people wonder why Canadian cricket does not get more media coverage. The captain of the CEO team was the Publisher and CEO of ‘The Globe and Mail’. Some other CEO’s heading some major Canadian companies, or the Canadian operational arm of a global company, were playing in the matches. CTV, part of the BellCTVGlobemedia conglomerate, were present on Monday. The battle to promote Canadian cricket will be won, somehow! Its too good a game to be lost forever. What influx of immigrants will be the new driving force to revive cricket in 10-20 years time if youngsters are not provided appropriate opportunities to play and enjoy the game? Nomads from the Sahara lands? Pacific Islanders? Last week CityTv's young sportsperson of the week in the Toronto area went to an Indian traditional sports event where only a pair of shorts were required to compete. A high proportion of Canada’s South Asians are reportedly at the poor end of the food-chain. Are the parents likely to be spending $300 on a cricket bat for a child? Bats, batting helmets, gloves and pads do not grow on trees. Bermuda Under-19s recorded a narrow 13-run win over Canada and, in doing so, have qualified for next year's U-19 World Cup. Bermuda set Canada 195 to win from their 50 overs but they slipped to 181 for 9, with Malachi Jones picking up 3 for 37. After being asked to bat on a bright sunny day in Toronto, Bermuda got off to a solid start before Kevin James (3 for 23) and Arsalan Qadir (3 for 24) began to make inroads. From 35 without loss, Bermuda slumped to 57 for 4, and it was a fifth-wicket partnership of 46 between Khiry Furbert, the wicketkeeper, and Malachi Jones (33 from 49) which began their recovery. The real rescue hero though was Stefan Kelly, the allrounder, who ended unbeaten on 52 from 55, adding a crucial 79 for the seventh wicket with Furbert. With Canada boasting a powerful batting lineup, 195 was most gettable. Ruvindu Gunasekera began in sublime fashion with 31 off 42 balls, including five fours, and he was given good support by Chris Manohar (40 off 70), with whom he put on 55 in 13 overs. It was lucky 13 for Bermuda, as the partnership was broken in that over, and the combination of off Tamauri Tucker (2 for 17) and Jones (3 for 37), saw Canada stumble to 90 for 5, and suddenly Bermuda looked to be in control. Rustum Bhatti threatened to take the game away from Bermuda but he was left stranded on 64 to spark Bermudan celebrations. The other match at the Maple Leaf South-West ground was another close affair as Cayman Islands Under-19s secured a narrow two-wicket win against Bahamas Under-19s. Chasing 213, Cayman Islands were coasting to victory with captain Ramon Sealy leading the chase with 66 off 77 balls, an innings which included 11 boundaries. However, they lost their way, losing four quick wickets for 15 runs and the score read 152 for 5. Robert Hewitt held the chase together with an unbeaten 25 and in the company of Corey Cato, the ninth wicket pair added 28 to attain the target. They had Mr Extras to thank as well as Bahamas conceded a whopping 42, including 31 wides. Earlier, Sealy won the toss and sent Bahamas in to bat and the openers responded with a stand of 66, with Jonathan Barry scoring 58. Jerry Jesubatham and captain Gregory Taylor then chipped in with 41 and 30 respectively to push the score to 212. Cayman Islands too struggled to contain the extras as the bowlers sent down 26 wides, conceding 38 extras in all. Bermuda claimed their first U19 Americas Championship today, defeating Canada by 13 runs in front of a raucous crowd at the Maple Leaf Cricket Club. The win puts them at the top of the table at the conclusion of the round robin tournament, and qualifies them for the U19 World Cup in Malaysia next year. Canada's fielders showed some early nerves, as the first ball of the match, delivered by Kevin James, found the edge of Chris Douglas' bat but was put down by Arsalan Qadir in the slips. Qadir gave Douglas a third life when his score was on 10, as he dropped him again. The early overs, though, were seen out safely by the Bermudian batsmen, obviously looking to hold onto their wickets. The first breakthrough for Canada came when James bowled a shortish ball that ballooned up off the gloves of Terryn Fray and found the hands of Chris Manohar. The next ball caught Steven Bremar leg before wicket, and Bermuda were 35 for 2. After Rodney Trott was caught behind off the bowling of Arsalan Qadir, Khiry Furbert came to the crease with the task of rebuilding the Bermuda innings. He did the job wonderfully, batting conservatively but solidly, never giving a chance to theh fielders. He partnered with Malachi Jones for a 46 run 5th wicket partnership and Stedan Kelly for a 79 run 7th wicket. He made 39 runs off 90 balls, lasting 134 runs at the wicket before being caught behind off a top-edged Qadir delivery.But the middle-order performance propelled Bermuda to a score much higher than one would have thought at the halfway point of the innings. Stefan Kelly was the top scorer, batting aggressively in making 52 runs off 55 balls and in 65 minutes, making his half-century on the penultimate ball of the innings. The total score for Bermuda was 194 runs for the loss of 8 wickets. Kevin James and Arsalan Qadir led the Canadian bowling attack, each taking 3 wickets, and conceding 23 and 24 runs each. Usman Iqubal was not his usual self, going for 43 runs and not taking a wicket. Further, the spinners who had done so well earlier in the weak were ineffective and failed to take any wickets. After lunch, the Canadian opening tandem of Ruvindu Gunasekara and Chris Manohar got their side off to a strong start, batting confidently and aggressively. In the first 10-over power play period, the score reached 48 for no loss, as they punished bowlers Stefan Kelly and Jordan DeSilva. The Bermudian bowlers tightened up shortly thereafter, and as the pressure built, Gunasekara fed a catch to Steven Bremar off the bowling of Tamauri Tucker to leave Canada at 55 for 1. The runs dried up during the second power play, and Tucker got his second wicket after Majid Usman nicked one into the gloves of Furbert behind the stumps. Canada were 66 for 2 after 17 overs, with the match very much poised. The troubles continued for Canada through the middle overs, as first captain Abishek Krishnamoorthy was bowled by Malachi Jones for a duck. Kevin James came in and then quickly followed him to the pavilion without troubling the scorers, and Canada were in a real hole at 75 for 4. Pratik Patel and Manohar were just beginning to build a partnership, when Manohar was removed on a somewhat controversial lbw decision which left the crowd murmuring -Canada were 90 for 5. The controversy continued when Jordan DeSilva caught Pratik Patel on the square leg boundary. The Canadian team was upset with the decision, saying the fielder had run outside the boundary to take it. The umpires conferred, and decided that the catch would stand, leaving Canada 101 for 6, and with the required run rate climbing through 7 runs an over. Rustum Bhatti and Arsalan Qadir built a partnership of 47 runs for the 7th wicket to give Canada some hope. Bhatti made his 50 off of 73 balls, and they continued to accelerate their batting as they neared the final 10 overs of the match. Bhatti ended up on 64 not out, but couldn't find any partners down the order, and though they fought to the end, Canada finished with 181 runs on the board for 9 wickets lost - meaning a 13-run victory for Bermuda! In the other match, Cayman Islands won the toss and invited Bahamas to bat first. They lost their first wicket with the score on just 5 runs, but battled back and posted what was by far their best score of the tournament. Johnathan Barry led the way with 58 runs, and Jeremy Jesubatham made a solid, supporting 41. With minor contributions from the rest of their batsmen, the total reached 212 for 6 - a formidable total! Kervin Ebanks was again the best Cayman bowler, taking 3 wickets for 39 runs in his 10 overs. Corey Cato was especially economical during his spell. He bowled 6 overs and conceded just 9 runs, taking 1 wicket in the process. The Cayman Islands showed what they are made of, in chasing down the target in 45 overs time, and for the loss of 8 wickets. Ramon Sealy again led the way with 66 runs, and Roderick Mitchell was the best bowler, taking 3 for 48. So Cayman Islands claim third spot in the tournament. The week here was an entertaining one by all accounts. The weather was perfect, the play was exciting, and the final day lived up to its billing as a battle of the top teams. In the end, though, Canada was undone by their own hesitation to throw the bat in the middle overs of their batting innings. Bermuda: Americas U19 Champions of 2007! Mississauga Ramblers was formed in 1966 with the aim of promoting the game of cricket, specifically at the grass roots level. We are still dedicated to providing an environment where young kids can learn the values of fair play and teamwork. We have one of the most thriving junior programs in the country, with over 125 registered junior members. The Cayman Islands came back from the disappointment of defeat against Canada, with a win over Bahamas to clinch third place in the ICC Americas Regional tournament on Saturday. Bahamas put up a solid batting performance to reach 212 runs for 6 wickets in 50 overs. The Cayman reply was going really well but stumbled after the top three batsmen were out. Overs were in hand, so sensible batting from the ninth wicket pair of Robert Hewitt (25 runs not out) and Corey Cato (9 runs not out) brought victory at the end of 45 overs. The game was well contested and should help both sides feel more confident after some tough games at King City, Ontario. Johnathan Berry scored an excellent 58 runs, and with Marc Taylor (23 runs) gave Bahamas a solid start. Gregory Taylor, the Bahamian skipper, put 30 runs on the board, before falling to a catch by Sealy at the wicket off Kervin Ebanks. Jeremy Jesubatham then played a fine innings of 41 runs, including 6 boundaries, so the first four wickets almost broke the 200 run barrier, failing by just one run. A couple of late innings wickets were lost in advancing the score to 212 runs for 6 from 50 overs. Kervin Ebanks ended with 3 wickets for 39 runs from his ten overs, including Jesubatham as well as Taylor in his victims. Sealy notched his third fifty of the tournament, missing out against Canada. McConvey was out first, for 32 runs with the total on 75 runs and the scoring rate going well. Sacha De Alwis helped keep the innings flowing but after Sealy was out for 66 runs (77 balls, 11 boundaries), the Bahamians enjoyed a spell of success with the ball. Opening bowler Roderick Mitchell took 3 wickets for 48 runs in the Bahamian cause. He was well supported by Jesubatham (2 wickets for 49 runs in 10 overs). But Hewitt lead the later Caymanian batting and steered his side to victory with 5 overs to spare. It was Bahamas first appearance in this ICC Americas Championship and there is promise for the future. Having spent most of the last year traveling around the High Performance Associates countries and the World Cup circuit, cricket lovers in both the Caymans and Bahamas might be interested to know that the message from the coaches is pretty much the same at all levels. Get the basics right. Bowl a good line and length for most of the innings, cut out the wides and other extras, play down the line of the ball, run the first run fast, and keep the score moving sensibly in building the base for the innings. Support staff, infrastructure and finance are in place for the top few. Believe it or not, Canada, the current senior leading high performance side in the Americas, had only one sponsors name on their shirts at this Under-19 event. The three advertising signs around the pavilion railings were due to the local ICC Americas office. At this difficult time, as a hurricane aims at Jamaica and may move on to the flat expanse of Grand Cayman, the players and officials at this event tried to put on a lighter face with comments about how strong the winds can be at Maple Leaf Cricket Club. The ground is in the heart of the Oak Ridges Moraine, a protected agricultural and natural beauty and resource area in Ontario. The north-west to south-east winds blew especially strongly on Friday. They were slighter on other days, sometime switching to west-east. However, on Tuesday, the wind blew hard from south to north, just to make it different. Credit must go to the ground staff and management at Maple Leaf CC for their efforts in staging these matches. It has been a busy summer at the ground. Grass wickets have returned to use on all of the five playing areas, with further improvements expected. But the acid test is in how well infrastructure is maintained after an initial upgrade. Bermuda beat Canada at King City on Saturday (August 18) to win the ICC Americas Under-19 Championships and earn at trip to Malaysia in 2008 for the Under-19 Cricket World Cup. Bermuda and Canada are the two highest ranked development countries in the Americas and contested an exciting match of fluctuating fortunes. At the end of the day, Bermuda won by 13 runs in winning this event for the first time. Canada can rue some dropped catches, some poor shots by key batsmen after the openers gave the hosts a potentially match-winning start, the two most successful bowlers not being used for the ten over maximum. Bermuda made 35 runs for the first wickets after a first-ball slip catch was dropped. Later, Malachi Jones was dropped in the covers when on 13. He did not go on to play ‘the innings of his life’, as his coach was exhorting, but he reached 33, a ‘personal bonus’ of 20 runs. A wicket nearly fell on that ball via a run-out, but it did not and one run was scored. Jones also took 3 wickets for 37 runs and was named Man-of-the-Match. A died-in-the wool Canadian supporter could argue a position of 71 runs for 4 wickets, might have been 36 runs for 5 wickets, if you do the math (maths) of deducting the 35 ‘bonus runs’ for the first missed catch. But the game might have gone a different way if the first catch had been taken. The reality was that Jones and wicketkeeper Khiery Furbert lead an initial recovery that ultimately setup Furbert and Stefan Kelly to push the total towards a defendable level. Kelly provided the driving spark with a knock of 52 runs. Bermuda did not quite make the 200 runs its coach was shouting for, but came close with 194 runs for eight wickets. Kevin James took 3 wickets for 23 runs in 9 overs and Arsalan Qadir took 3 for 24 in 8 overs. So in the absence of a decent scoreboard that aids players and spectators (but who cares about them in Canadian cricket?) to see how many overs each bowler had bowled, the leading duo had 3 unused overs. But in cricket, as in life, you just have to deal with the situation as you find it, so Canada had to make 195 runs to win in 50 overs or less. Left-handed opening batsman Ruvindu Gunasekera again was in the runs. He lead the charge to 58 runs in the 13th overs before driving to short cover and being caught. He was out to the off-spin of Tamauri Tucker who turned in a match transforming spell. His ten overs cost just 17 runs and he gained a second wicket. Chris Manohar served as a useful anchor for the Canadian innings, but came under pressure to accelerate his scoring after failures by other top-order batsmen. Gunasekera had helped push Jones out of the bowling attack at an early stage, but this left Jones, an experienced senior international, available to bowl later in the innings. As were senior internationals Kelly and skipper Rodney Trott. A position of apparent Canadian dominance was transformed into a score of 90 runs for 5 wickets. A catch near the boundary to dismiss Pratik Patel saw Patel start to walk and then hover as a couple of small groups of people on the western side of the ground signaled for a six or a wicket. The umpires conferred and confirmed the dismissal. A still photo on my camera shows the fielder near the painted boundary line, but the camera did not go off at the instant of the catch, but I believe after he had held the ball for a sufficient time for the catch to count. He then threw the ball in the air in celebration of a key dismissal. The fielder is not transparent so the ball, that I think was no longer in his right hand, cannot be seen in the picture. Perish the thought that the Canadian Cricket Association’s leadership might have thought this event worthy enough to have had four or more TV cameras and opened up the potential for reviews by the third umpire! I believe the ICC Americas Development Office would have been progressive enough to try out such a facility. There was nothing issued by the CCA in the way of an event brochure – Argentina managed to produce one to celebrate the visit of Under-19 and women’s teams to the current tournaments at King City – or even a simple list of players and, where relevant, playing numbers. There were some announcements heard at the ground on Saturday, but these were drifting on the wind from the Dragon Boat races at the nearby Seneca College King Campus. There were even some signs for the Dragon Boat races. Wicketkeeper Rustum Bhatti tried to turn the tide with a battling innings of 64 runs not out. Some of the running between the wickets was slow. The old adage of run the first run quickly was not always followed. But Bhatti gave his side a chance. The senior level ODI and first-class bowling experience told in the end, and the Bermudians, with additional support in the closing stages from the Bemudian women’s cricket team, went on to win a key first victory over Canada in this tournament. Malachi Jones took one wicket and conceded very few runs in bowling the 48th and 50th overs of the Canadian innings. He gained man-of-the-match honours and later, Bermudian off-spinner Tamauri Tucker was named bowler of the tournament. Canada’s Ruvindu Gunasekera was named the batsman of the tournament. Who knows, perhaps he could end up being the start of a series of South Asian heritage players who begin an international career in Canada, after formative years developing in Canada, and go on to appear in Test Cricket for a South Asian country. The international cricket scene at the Maple Leaf club now switches to the Women’s event, involving Trinidad & Tobago, Bermuda, Canada and Argentina. Can the faithful few from the mainstream Greater Toronto Area cricketing circuit expect to see evidence of active leadership by ‘top’ CCA Executives in the coming week? The weight of evidence from this summer’s home Intercontinental Cup, ODI and Under-19’s tournament yields only one conclusion. No. Still, it will be nice to see former Glamorgan stalwart Tony Cordle, coach of the Canadian women’s team. Congratulations to Bermuda, the other players, coaches and supporters, to ICC Americas Development and the unpaid volunteers who keep Canadian cricket going. Bermuda were given an initial best wishes for the Under-19 World Cup send-off at the post-tournament gathering around the pavilion and playing fields of Maple Leaf CC on Saturday night. Wishes were also extended that the current hurricane manages to bypass the islands of the Caribbean. “There is no better sport than cricket to develop relations for life”, said the Bermudian Minister of Education, Sports and Recreation, the Hon. K.H, Randolph Horton, during the closing ceremonies. He spoke warmly of the cricket he had seen played, the spirit in which it had been played and hoped the players had had ‘a lot of fun’. The Waterloo Sunrise Cricket Club men's under-19 team played a team from the Toronto Ladies Cricket Association in a friendly match on the cricket ground at Waterloo Park. Sunrise won 180-100. The match wasn't meant to be a battle-of-the-sexes showdown, though. It was billed as having a "special focus on women and children" and was intended to attract local youth, both female and male, to the club and to raise awareness of cricket in the community. "It's about a healthy community," said Yogesh Shah, club secretary. "It's about encouraging the youth and providing them with physical education." "Cricket is the sport of many new Canadians," said Shawky Fahel, the club president. "Cricket is the glue that brings people together. This is an attempt to bring girls in." Waterloo Sunrise Cricket Club has 80 to 100 active members, most with roots in India, Pakistan, the Caribbean or Afghanistan, all areas where cricket is played and often as ferociously supported as soccer is in Europe and Latin America. "Your support here is great for women's cricket," Toronto captain Mona Persaud said as she accepted a commemorative trophy from Fahel. "I'm hoping next time we come we'll have a women's team to play against here." Getting both sexes involved in the sport in Waterloo Region may be tough -- like "batting on a sticky wicket," as a cricket player might say. What Fahel called "old moralistic cultural values" may come into play. Waterloo club hosts Toronto women's team for a friendly match to attract a new crop of young players. Cricket has been played in the Kitchener and Waterloo area since at least 1905, but it still isn't a woman's game -- here anyway. In cricket, two teams of 11 players compete on a grass field, at the centre of which is a 20-metre-long area called the pitch. At each end of the pitch is a set of parallel sticks called a wicket, made up of three vertical stakes -- the stumps -- with two loose pieces of wood across the top called bails. The bowler, a position like baseball's pitcher, hurls a heavy fist-sized ball down the pitch and tries to hit the wicket to knock the bails off, usually bouncing the ball off the ground in the process. The batter tries to defend the wicket by hitting the ball with a flat wooden bat. If successful, the batter runs to the other end of the pitch while a teammate runs the opposite way. The team scores one with the exchange. And the scores build up quickly. "In Indian tradition, the parents don't want their little girl to play cricket," said Mukesh Jeranie, a team manager and umpire. "It's possible, but it's a slim chance for us to see a women's team of 11 play here." Jeranie said he wouldn't want his own two girls playing cricket. He has been injured a number of times in the sport. Monali Patel of Kitchener plays with the Toronto Ladies Cricket Association team and with the national women's team. In about two weeks, she and Persaud will be competing against international-level women's teams from Trinidad and Tobago, Argentina and Bermuda at the Canadian Women's Cricket Tournament in King City. Patel said the sport first needs more recognition to bring locals, including women, out to play in Kitchener and Waterloo. She said she used to play on a men's team but heard sexist comments regularly. She now plays in Toronto on an all-female team. "You've got to feel welcome when you play for a team," she said. St. Catharines City Cricket Club team post a major win while playing in the 20/20 Ed Burn tournament last Sunday at Mohawk Park in Hamilton. A well knit team of 11 lead by Nasir Mahmood and Javed Main knocked the leading H&D team of Crescent C C. out of the 20/20 tournament. The win was so dominating that it appeared to be a one sided match when St. Catharines beat Crescent comprehensively by 7 wickets' and outperformed them in all departments i.e. bowling, batting and fielding. Crescent batting first, managed to score 151 runs and went all out in the second last over. The attack bowling of St. Catharines, opened by Nasir Mahmood and Naveed Sehrai, was close to perfection and gave only 5o odd runs in the first 10 overs. Nasir captured 3 wickets while leg spinner Bilal Akhtar did major damage to the Crescent batsmen by taking 4 key wickets. Both Bilal and Naveed also took superb catches in the out field. Fardeen Aziz run out was remarkable. In reply, St. Catharines opened the batting with Warna Peiris and Adeel Khan. Both of them set the tone as the score climbed quickly to 30+ in only first overs. Warno, a true WALL as an opening batsman capitalized every opportunity to score runs. Imran Aslam, batting one down, showed all the Crescent batsmen how to really hit a sixer, when his 3 sixes crossed the grounds in high air while one of them landed in outside areas of adjacent parking lots. As the top order set the run rate, Nasir Mahmood, back in his usual form, paced his innings aggressively and scored his half century BUT making sure that he remained on the crease when St. Catharines passed the 152 mark in only 16 over with FOUR overs to spare. Warna also remained not out at 36. This win has settled up the scores and some vision of all teams in the league that on a give day, any team is beatable. For the records, Crescent CC, a highly competitive team composed of some of the best cricketers in the area, has now suffered their very first loss of the 2007 season. Canada crushed the Cayman Islands by 9 wickets on Friday (Aug 17) to setup the big finale of the ICC Americas Championships with Bermuda. The winner of Saturday's (Aug 18) match at King City goes on to the ICC Under-19 Cricket World Cup in Malaysia in February 2008. Canada won by 9 wickets after bowling out the Caymanians for just 77 runs. Key Canadian performers were Arsalan Qadir took 5 wickets for just 6 runs, Kevin James with 3 wickets for 41 runs (he made the early breakthroughs), skipper Abishek Krishnamoorthy for his skillful handling of bowlers and field placings, and in-form opening batsman Ruvindu Gunasekera who scored 36 runs not out. In the day's other match, Argentina beat Bahamas by 4 wickets. Bahamas meet Cayman Islands to complete the tournament on Saturday. Play is scheduled to begin at 10.30 am at Maple Leaf Cricket Club, King City. Canada won the toss and elected to bowl. Kevin James soon justified this decision by bowling Darren Cato with the second ball of the match. Sacha de Alwis struck some useful shots in the early going after being dropped at second slip almost as soon as he came to the crease off James. James hit back by bowling dangerman Ramon Sealey with the total on 28. Sealey had scored half-centuries in the Cayman's previous matches. De Alwis fell caught by the wicketkeeper to Arsalan Qadir, who took two wickets in his first over from the southern end of the ground. The screws were turning as the Cayman Islands teetered on 40 runs for 4 wickets. De Alwis had scored 26 of those runs, including 5 boundaries. The 17-year old Qadir, watched by his family, went on to take 5 wickets for 6 runs in an excellent spell of bowling. The spin bowlers were brought into the attack, took a quick wicket and were replaced by the faster bowlers to kill off the remainder of the Cayman batting. Canadian captain Abishek Krishnamoorthy, another 17 year old, deserves a lot of credit for the way he switched the bowlers around. The end came in the 26th over when Usram Iqbal had Darado Thomson caught for 13. The total was 77 runs. Kevin James ended with 3 wickets for 41 runs from 10 overs and took an excellent, low one-handed slip catch. Ruvindu Gunaskera continued his fine tournament form with a sparkling 36 runs not out. He is just 16 years old and clearly has tremendous potential. Khrishna (Chris) Manohar was going well, until he pulled a ball from wide of the off stump to be caught at square leg with the score on 53 runs. Majid Usman made 16 runs, including the only six of the game. Gunaskera struck the winning boundary midway through the 10th over. Canada ended on 79 runs for the loss of 1 wicket. It was a clinical performance by the young Canadian side. Now comes the battle for Americas Associate country supremancy with Bermuda. Two Bermudians players, Stefan Kelly and Malachi Jones, were in the West Indies as part of the senior 2007 Cricket World Cup squad. Captain Rodney Trott has also played for the senior Bermudian side in the Intercontinental Cup. Both sides are unbeaten with 3 wins from 3 matches. Previous form this week helps, but in a way does not matter. This is the big test. Who will produce the goods on the day? Canada has won all three previous Americas Regional Under-19 games against Bermuda; winning one by just 1 run. A tie would put Canada through on net run rate, but you only set out to win. It should be a fine game. It will be interesting to see who turns out to support these teams. Wickets tumbled freely in the early going as Bahamas and Argentina battled it out in a game that could decide last place in the group. Bahamas batted first but only opening batsman Jonathan Barry made it into double figures. The total of 113 runs all out in 37.2 overs was padded by 38 wides! Leading the Argentinian bowling were Thomas Birnie, with 4 wickets for 23 runs, and Pablo Sircusa, who returned 3 wickets for 19 runs. Argentina made 24 runs for the loss of 1 wicket off 10 overs by the lunch interval. A storm came over the ground - the first rain during the tournament - but eventually play resumed with a howling wind blasting from the north-west. There were a few Argentinian batsmen who reached double figures, Pedro Bruno topping the list in reaching 18 runs. The developmental aspect of this competition showed through as at times, the batsmen seemed to be moving towards the win, but wickets would fall. In the final analysis, some unusual field placings, wayward bowling that saw 29 wides given away, and a decision to use an off-spinner bowling into the fierce wind by the Bahamians contributed to the result. Argentina won the game from a wide - it just had to happen sometime in this tournament - in the 27 over. Bahamas bowler Roderick Mitchell took 3 wickets for 41 runs. Still, it gives the coaches plenty to talk about with their players. Players from all teams mix freely at events like these and it helps foster new friendships through cricket. Bahamas meet the Cayman Islands on Saturday (Aug 18). Learn to manage Cricket teams at an international level, administer your countries domestic competitions, and oversee all cricket operations at the local or international level. The Cricket Management Course is a fully accredited 8 week online course that offers cutting edge theories on how to develop a career in professional and amateur cricket. The Cricket Management Course will cover issues including cricket team operations, cricket club management, talent identification, team sponsorship, umpiring, coaching, junior cricket, women’s cricket, new technologies of recruiting, traditional recruiting, the business of running a cricket club and other essential tools of modern administrators of professional and amateur cricket clubs. As cricket grows globally, so do business opportunites within the game. Whether you want to work at Lord's, Eden Gardens, Sabina Park, Bellerive Oval, Old Wanderers, or just increase the involvement of your school cricket program this 8 week online course will launch your cricket success. You will learn the skills and stategies which are needed to advance cricket worldwide. Those individuals with a passion for the game of cricket need insider knowledge on cricket club operations, cricket recruiting, player management and evaluation and the overall business of cricket. If you want to further your career in cricket you need to learn and be mentored by those successful in the game. This 8 week online course could be the foundation or the advancement of an exciting career in cricket. Cricket Agents and recruiters need to know how to objectively recruit players from all over the world. They also need to know how technology is affecting the cricket clubs budgets. Every successful business, including the business of Cricket, has a winning formula. This course will teach you the successes and failures of the most successful cricket teams and programs in the world. Roger Barnes, cricket agent and co-founder of Sports International Management Ltd., in London, began his career in accountancy. Roger's knowledge and expertise ranges from a junior partnership of Adams, Barnes & Company to the Finance and Administration Director of G Munch Jorgensen International Ltd., an international finance company. A passion for cricket led to a professional change of direction and Roger focused his financial expertise in assisting his cricket clients. From there he became the founder of a successful and respected sports management company, Master Sports. Roger has now been involved in sports management for over ten years and has represented many first class and legendary cricketers. Roger has a vast experience of sports player representation, negotiation of contracts and interaction with the media. He has worked to clinch sponsorship and endorsement deals for his various cricket clients and has organized various sports events. His experience renders him an ideal bureau for cricket representation and contractual advice. Roger will share with students the agent side of the cricket business including endorsements, contracts, event planning and sponsorship. For those of you interested in changing professional careers due to a passion for cricket, Roger will be a great mentor. Western Oregon University, which is part of the Oregon University System, has approved this course for academic credit. Students wishing to earn credit will need to register for the credit directly through Western Oregon University and pay an additional fee of $45 per credit. Students enrolling in this course should consult with their academic advisors to determine what requirements the course may fulfill. That decision is at the discretion of the university accepting the transfer credit. For more details contact Sports Management Worldwide at 1-888-952-4368. Canada needs to beat the Cayman Islands on Friday and then beat Bermuda to qualify for the next ICC Under-19 Cricket World Cup in Malaysia next yeat. Both games are at Maple Leaf CC, King City, Ontario (corner Dufferin St and 15th Sideroad). Scheduled start time 10.30 am and admission is free. Canada has won both matches against the Cayman Islands in previous tournaments and all three against Bermuda. However, the win over Bermuda in 2003 was by just 1 run. The first ICC Americas Under-19 Championship was staged in Bermuda in 2001, Canada, captained by Ashish Bagai, won the tournament and went on to the Under-19 Cricket World Cup. Maple Leaf CC in Ontario has served as host for the 2003, 2005 and current 2007 tournaments. Canada won in 2003 but the USA won in 2005. Canada's total of 423 runs all out (49.4 overs) in Wednesday's match with Bahamas is Canada's highest total to date, beating the 347 runs for 7 wickets (50 overs) against Argentina in the 2003 tournament. Ruvindu Gunasekera's 155 runs is the highest individual score for Canada in this tournament. Trevin Bastiampillai scored 110 runs not out against Bermuda in the 2005 tournament. Sohan Anjaria top-scored with 88 runs not out in the previous highest total against Argentina. Pratik Patel's 7 wickets for just 3 runs improves on Umar Bhatti's 6 wickets for 10 runs against Argentina in 2003. The winning margin of 343 runs is 21 runs greater than the win over Argentina, by 322 runs, in 2003. Before the Americas Under-19 Championships began, Canadian players first appeared in the World Under-19 Championships as part of the Americas Development XI. Canada's wicketkeeper/batsman Ashish Bagai captained the Americas in the January 2000 World Championships. In two appearances at the Under-19 Cricket World Cup (2002 & 2004), Canada's highest score was 213 runs for 9 wickets in 50 overs batting second in a tie against Bangladesh in 2003. Ashish Bagai made 82 runs not out. Canada has played 5 group matches in the main WC groups (won 0, tied 1, lost 5) and six games in subsequent Plate matches. The Gunasekera/Pratik Patel stand would seem to be a Canadian record, probably for any wicket in this competition. Openers Ruvindu Gunasekera and Terryn Fray stroked centuries of contrasting styles and offspinner Pratik Patel captured a remarkable 7 for 3 as Canada and Bermuda maintained their winning streak in the five-team round-robin Americas Under-19 World Cup qualifier in Toronto. Gunasekera hit a 107-ball 155, punctuated with 25 boundaries, and Patel recorded figures of 5-2-3-7 to play pivotal roles in Canada's 343-run victory over the Bahamas. Fray scored a watchful 144-ball 119, which included six boundaries to inspire Bermuda to a 230-run win over Argentina. It was Bermuda's third successive victory while for Canada it was their second from as many games. As things are shaping up in this event, it appears that the winner of the Bermuda and Canada match on Saturday will decide who joins the ICC's 10 Full Members, hosts Malaysia, Papua New Guinea and Ireland at the 16-team U-19 World Cup in Malaysia next February. In the Canada-Bahamas match, Gunasekara was in a punishing mood as he completely dominated an inexperienced Bahamas bowling attack by making the ball disappear to different parts of the ground at regular intervals. His stroke selection was immaculate as he successfully pierced the field to score most of his runs in boundaries. Gunasekara was involved in a 182-run fourth-wicket partnership with Pratik Patel to lay the platform for a huge score of 423 in 49.4 overs after Canada, put into bat, were reduced to 92 for 3. Patel scored 75 from 68 balls with three fours and a six. Kevin James provided further impetus to Canada's run riot as he struck nine boundaries in his 30-ball 57. Hasan Raza Zaidi (33) and Rustum Bhatti (28) also scored at more than a run-a-ball to make sure the Bahamas were batted out of the match. Standings (unofficial): Bermuda has won 3 of 3, Canada has won 2 of 2, Cayman Islands has 1 win and 1 loss. Canada’s Under-19 cricketers blitzed the Bahamas with both bat and ball on Wednesday. Canada pounded a massive 423 runs all out, headed by left-handed opening batsman Ruvindu Gunasekara’s 155 runs. He dominated an opening stand of 70 runs for the first wicket before combining with Pratik Patel to pile on 182 runs for the 4th wicket. Patel made 75 runs and in the closing overs, Kevin James plundered a quick 57 runs. Bahamas was never likely to be in contention with the bat, but Marc Taylor and Jonathan Barry made steady progress in an opening partnership of 70. Taylor was then stumped by Rustrum Bhatti off the bowling of Pratik Patel, the fifth bowler used by Canada. He had made 40 runs from 47 balls, including five boundaries. The innings then crumbled as Patel followed hit 75 runs by taking 7 wickets for a mere 3 runs. Chris Manohar chipped in with a couple of wickets for 13 runs and the Bahamas innings collapsed to just 80 runs all out. Canada won by 343 runs and now faces Cayman Islands on Friday. The day was reward for the Canadian squad, the coaches and the small group of family and friends who have supported the recent practices and warm-up games. Gunasekara had 25 boundaries from 107 balls in his pace setting innings of 155 runs. An early slip catch chance that went begging will soon be forgotten by the Canadian camp; probably not by the Bahamians. Patel’s 68-ball innings of 75 runs included 3 boundaries and a six. Kevin James sent 9 of the 30 balls he faced to the boundary. Bermuda won for the third time and await Saturday’s match with Canada that should be the championship and the World Cup qualifying place decider. Bermuda opening batsman Terryn Fray provided the foundation for a large total of 300-plus. The third wicket stand with Malachi Jones turned the tide heavily against the Argentinians. Jones powered his way to 44 runs. Fray reached his century in the 41st over out as the score reached 244 runs for 4 wickets. Marco Bassett with 26 runs and Lamar Richardson with 29 runs not out kept the scoring momentum going in the closing overs. Argentina was soon in trouble, losing a wicket before a run had been scored and just 6 runs were on the board when the second wicket fell. Gregory Maybury’s fine spell of bowling had the batsmen in trouble. He ended with 4 wickets for 15 runs. Captain Rodney Trott bowled some experimental deliveries in a couple of overs that cost some runs, but he restored Stefan Kelly to the bowling attack and the final wickets were taken, as well as several near misses as batsmen played and missed. Kelly’s 4 wickets were picked up at a cost of 26 runs. Canada and Bermuda lived up to their pre-tournament favourites' tag by scoring convincing victories in their Americas Under-19 qualifiers in Toronto on Tuesday. Canada beat Argentina by nine wickets while Bermuda won their second match in a row by beating Cayman Islands by seven wickets. Canada bowled out Argentina for 64 in 28 overs and then raced to victory in 9.5 overs for the loss of one wicket, ending Argentina's chances of qualifying for the U-19 World Cup. Asif Manjra, Usman Iqubal and Pratik Patel took three wickets each and opener Ruvindu Gunasekera ensured a healthy run-rate by scoring 35 off 33 balls. Bermuda, who had crushed Bahamas by 195 runs on Monday, restricted Cayman Islands to 165 in 48.2 overs after asking them to bat. Cayman Islands captain Ramon Sealy once again top scored with 67 off 126 balls that included five fours. He had scored an unbeaten 76 against Bahamas. Malachi Jones picked up 4 for 38 for Bermuda while Stefan Kelly took 2 for 13. Bermuda reached the target in only 30.4 overs for the loss of three wickets. Jones backed up his excellent bowling performance with an unbeaten 41 from 27 balls with six fours and one six. Jones added 79 for the fourth wicket with captain Rodney Trott (37 not out) after Bermuda were reduced to 87 for 3. The tournament winners qualify for the Under-19 World Cup in Kuala Lumpur, Malaysia, next February. After sweeping both games in Vancouver they continue tomorrow against the Vagabonds at Beacon Hill Park 1:00pm start time. Saturday 18th at Beacon Hill Park. Please see Guy Drake or David Billingham with your donations. Cricket has been played in the Kitchener and Waterloo area of Ontario since at least 1905, but it still isn't a woman's game -- here anyway. The Waterloo Sunrise Cricket Club men's under-19 team played a team from the Toronto Ladies Cricket Association in a friendly match Sunday afternoon on the cricket ground at Waterloo Park. Sunrise won 180-100. Canada raced to victory over Argentina in Americas Under-19 tourney romping to a 9 wicket win on the second day of the ICC Americas Under-19 tournament at Maple Leaf CC on Tuesday, Aug 14. Canada dismissed Argentina for just 64 runs (27.4 overs) and then raced to 67 runs for the loss of 1 wicket in less than ten overs. Medium-pace bowler Usman Iqbal took 3 early wickets for 9 runs and the later batting succumbed to spin bowlers Pratik Patel and Asif Manjra. Patel took 3 wickets for 26 runs in 6 overs, Manjra 3 wickets for just 9 runs in 5 overs, and Iqbal’s wickets cost just 16 runs in 6 overs. Opening bowler Kevin James bowled with hostility and beat the bat several times. He had to be satisfied with taking the last wicket of the Argentina innings. Extras was the highest score for the South Americans, the tally of 13 runs included 11 wides. Pablo Siracuso proved the hardest batsman to dismiss. He played 53 balls for 5 runs. He showed a straight bat, that was beaten several times, but as with some of his colleagues, more games at this level would help build experience. The last wicket stand of 15 runs was the highest of the innings, indeed last man Hernan Fennell was the top-scoring batsman with 11 runs not out. Canada surged to victory in less than ten overs batting, but both opening batsman played some careless shots. Majid Usman spooned the ball into the covers and was caught for 10 runs. Ruvindu Gunasekera also popped the ball up to a cover fielder but was dropped. Gunasekera went on to lead the victory romp with 35 runs not out. Both of these players can bat, but need to be more careful about shot selection. Building an innings is a key skill needed in cricket in order to develop winning ways. Malachi Jones fine all-round performance steered Bermuda to a 7 wicket win over the Cayman Islands. Jones took 4 wickets for 38 runs in 9 overs, eventually bowling Cayman batting hero Raymon Sealey for 67 runs (5x4’s). It was Sealey’s second score of 50 in just two tournament matches. He was the sole early resistance as his side slid to 41 runs for 4 wickets. Sealey and Vincent Ebanks, who made 38 runs, then added 99 runs for the 5th wicket, before Sealey was bowled. Vincent Ebanks was out three runs later and the total sputtered to 165 runs all out. Bermuda opening bowler Stefan Kelly took 2 wickets for 13 runs in 9.2 overs. There were 28 extras, included 17 wides. ‘Wide-disease’ has been a feature of this tournament to date. Some may argue the winds, that today began from south-east to north-west, the opposite direction from Monday, and that switched to west-east by mid-afternoon, might be a factor. But some of the balls have basically gone in the direction the bowler was facing. There have been some very wide wides on the two opening days and the coaches will be losing some hair if this trend continues. Bermuda lost two wickets reaching 28 runs, but a stand of 59 runs between captain Rodney Trott and Khiry Gilbert turned the tide. Gilbert was out with the total on 87 runs. Malachi Jones joined Trott and began a forceful innings that included six boundaries and a straight drive for six. Jones was 41 runs not out when Bermuda reached the 166 run target. Trott’s 37 runs not out included 5 boundaries. The Cayman bowlers gave away 33 wides to keep the tally of extras booming. Due to predicted heavy rain on Thursday, the team managers have agreed to advance Thursday’s matches to Wednesday. Canada (1 win, 0 defeats) will meet Cayman Islands (1 win, 1 defeat) and Bahamas (0 wins, 1 defeat) plays Argentina (0 wins, 2 defeats). Bermuda (2 wins, 0 defeats) sit out this round of matches. Play is scheduled to begin at 10.30am at Maple Leaf Cricket Club, King City. Bermuda and the Cayman Islands easily won on the opening day of the ICC Americas Under-19 Championships. Bermuda had a 195 run win over Bahamas, while the Caymans powered to a ten wicket win over Argentina. Canada, the other side in this competition, did not play on opening day but face Argentina on Tuesday. Bermuda and the Caymans go head-to-head in what could be a key encounter. Bermuda had key performances from lower-order batsman Dennico Hollis, who made 76 runs not out, and spin-bowler Tamauri Tucker, who took 6 wickets for just 9 runs in 6.4 overs. Hollis' and the tail-end batsmen pushed the total to 300 for 8 wickets off 50 overs. Hollis came to the crease with the score on 141 runs for 6 wickets. Opener Steven Bremer had made 43 runs. Jonathan Barry took 4 wickets for a rather expensive 71 runs for Bahamas. Bahamas began reasonably but the reply began to stall after the first drinks break on a hot but windy day. The Bahamas attack included two pace bowlers with senior international experience: Steven Kelly and Malachi Jones. The introduction of spin bowling brought the game to a conclusion. Tamauri Tucker was the main wicket taker, but captain Rodney Trott, another with senior international experience, took 2 wickets for 14 runs in 9 overs. Bahamas skipper Gregory Taylor was third out with the total on 96 runs. The last eight wickets went down with just 9 runs added, as Bahamas was bowled out for 105 runs in 37.4 overs. Argentina opening batsman Augusto Mustafa battled away for 34 runs but was fourth out with 83 runs on the board. The innings then folded as Sacha de Alvis took 5 wickets for 16 runs in 5.1 overs, including Mustafa. Three boundaries by the last man, Santiago Riaz Nicolitti, was the main resistance as Argentina was all out for 126 runs (28.1 overs). Ramon Sealey powered to 76 runs not out in an unbeaten opening stand of 128 runs with partner Zachary McLaughlin, who made 25 runs not out. The victory romp was interupted only by the lunch interval,when 102 runs had already been tallied. The win came in just the 19th over of the Cayman innings. The tournament winners qualify for the Under-19 Cricket World Cup in Kuala Lumpur, Malaysia, next February. Bermuda 300 runs for 8 wickets (50 overs) beat Bahamas 105 runs all out (37.4 overs) by 195 runs. Argentina 126 runs all out (28.1 overs) lost to Cayman Islands 128 runs for no wicket (18.4 overs), by 10 wickets. All matches are due to start at 10.30 am at Maple Leaf Cricket Club, King City, Ontario. ** Play began late on Monday due to heavy rain on Sunday at the ground. The Bermuda match began at 11am and the Cayman Islands game at 12.15pm. Play is expected to be on time on Tuesday. Canada face a stiff challenge from Bermuda in their bid to return to the Under-19 World Cup when the five-team round-robin Americas U-19 Qualifier begins at Mapleleaf CC, King City in Toronto on Monday. Argentina, Caymans Islands and debutants Bahamas are the other teams taking part in the week-long competition. The winner will join the ICC's 10 Full Members, hosts Malaysia, Papua New Guinea and Ireland (who recently qualified from the East-Asia Pacific and European Regions respectively) at the 16-team U-19 World Cup to be played in Malaysia next February. 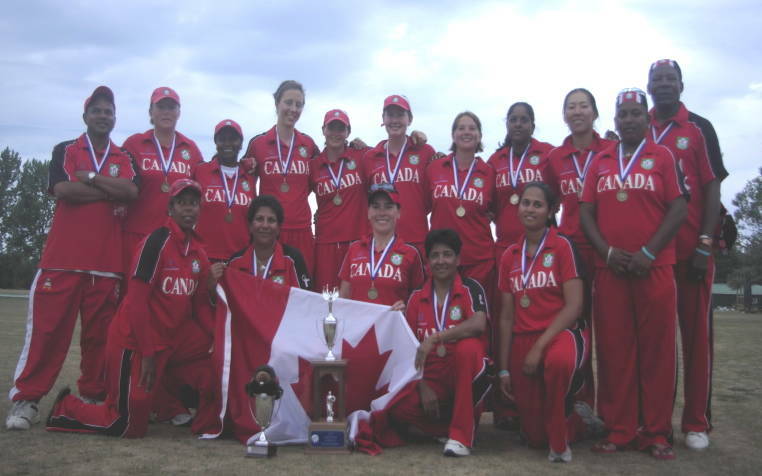 Canada missed the 2006 event in Sri Lanka but participated in the 2002 and 2004 tournaments. Familiar home conditions, an improving infrastructure and more international exposure helps Canada to start as firm favourites and coach Courtney Gonsalves is optimistic that his players are ready for the event. "All the players attended the elite programme we started last October in which we set up talent hunt and training camps throughout Canada," he said. "Our goal is to qualify for next year's U-19 World Cup and I am sure that the combination of this elite programme along with exposure in the premier division will help us achieve our target." However, Canada are likely to be tested by Bermuda who have been bolstered by the inclusion of allrounders Malachi Jones and Stefan Kelly, who played in the recent full World Cup, while the youngsters' captain Rodney Trott narrowly missed the event. The trio will rejoin the senior Bermuda team for the match against Ireland in the ICC Intercontinental Cup after completing the Toronto assignment. Bermuda coach Arnold Manders believes his team's hopes of earning a finals berth are better than ever. "I think our chances of winning are greater than previous years because we have played more matches as a team and the players are confident in their individual roles." Bermuda prepared for the tournament by playing eight domestic 50-overs-a-side competition matches between May and June besides participating in the Sir Garfield Sobers Cricket Tournament in Barbados which was also used as a training camp for the Americas U-19 Qualifier. "We have worked tirelessly on the team concept, and the individual discipline of the players have really improved. Our team this year is mentally stronger [than previously] and combined with the intense training the players received from the coaches, this should result in a good team combination. The players have the knowledge and now they need to produce." For Argentina, it will be their first appearance in this event as an ICC Associate Member. They have previously struggled at the junior level but it would be dangerous to discount them, particularly after the senior team's heroics in Darwin in June where they earned promotion to the World Cricket League Division 2 by qualifying for the final of the Division 3 tournament. Middle-order batsman Pedro Bruno, left-arm seam bowler Santiago Irigoyen and allrounders Ignacio Redruello and Tomas Birnie were part of that successful campaign in Darwin, but instead of making big predictions, coach Hamish Barton has set his sights on winning at least once in Toronto. "Basically our main goal is to win one game. We feel this is a realistic goal for the Argentine team considering the team's past performances and the stage of its development." Barton said the sport is still in the embryonic stage in Argentina and the team has prepared as best it can in the tough winter season. "The players are very much in the development stage and we are aiming to do the basics right and achieve our specific goals for each skill area, the experience and exposure to international cricket. "The team has prepared as best it could as it is winter in Argentina at the moment and training has been extremely difficult at times. But the team has trained well and the development of the players over the last three months has been very pleasing." Caymans Islands have always been very competitive at youth level and nobody is expecting them to be far behind this time. Captain Ramon Sealy, along with top-order batsman Darren Cato and bowler Kervin Ebanks, have played in the Caymans Islands domestic Division 1 tournament for the last two years. Sealy sees batting as his team's strength. "I think the team has a good chance of winning because we have a strong batting line-up which is not only capable of setting high totals but chasing them as well." Bahamas are the only Affiliate Member in the group and are fielding a team for the first time. The senior team will participate in next year's ICC World Cricket League Division 5 to be played in Jersey in May. Bahamas captain Gregory Taylor hopes that the Americas U-19 Qualifier will help his country's bid towards earning ICC's Associate Membership. He said: "We hope to achieve recognition as an Affiliate power house and to show the ICC and the world that we are ready to become an Associate Member of the ICC. Two years ago we did not have a full U-19 team, but we worked hard under the guidance of coach John Welch to achieve this. Jonathan Barry, Jeremy Jesubatham, Rodrick Mitchel and I came up in the U-15 program from 2001 and have played a lot of cricket with the seniors." The United States of America, who took part in their first U-19 World Cup in Sri Lanka in 2006 are missing this time as the USA Cricket Association is currently suspended as an ICC Member. Argentina: Juan Tomas Birnie (captain), Alejo Tissera, Augusto Mustafa, Facundo Duggan, Hernan Fennell, Horacio Esperon, Ignacio Fermani, Ignacio Redruello, Juan Pablo Bordacahar, Pablo Siracusa, Pedro Bruno, Ramiro Rodriguez Delgado, Santiago Iritxity Irigoyen, Santiago Paez Nicoletti. Christian Tunon (manager), Hamish Barton (coach) and Esteban MacDermott (assistant coach). Bahamas: Gregory Taylor (captain), Adrian Dean, Ambry Moss, Anwar Sawyer, Corie Frazer, Franz Taylor, Fritz Stubbs, Jeremy Jesubatham, Jermaine Adderley, Jonathan Barry, LaSalle Thompson, Marc Taylor, Rodrick Mitchel, Rudolph Fox. Paul Thompson (manager) and John Welch (coach). Bermuda: Rodney Trott (captain), Christopher Douglas, Dennico Hollis, Greg Maybury, Hodsoll Kyle, Jordan De Silva, Khiry Furbert, Lamar Richardson, Malachi Jones, Marico Bassett, Stefan Kelly, Steven Bremar Jr, Tamauri Tucker, Terryne Fray. Gerald Bean (manager), Arnold Manders (coach), Andre Manders and Cleveland Wade (assistant coaches). Canada: Abishek Krisnamoorthy (captain), Chris Monohar (vice-captain), Arsalan Qadir, Asif Manjra, Hasan Raza Zaidi, Jaskeerat Singh Kalon, Kevin James, Khushal Gangopadhyay, Majid Usman, Pratik Patel, Riayzkhan Pathan, Rustum Bhatti, Ruvindu Gunasekera, Usman Iqubal. Wijay Senathirajah (manager), Courtney Gonsalves (coach) and Dan Keisel (Physio). Cayman Islands: Ramon Sealy (captain), Corey Cato, Dale Parker, Darado Thompson, Darren Cato, Earl Hart, Kervin Ebanks, Patrick McConvey, Robert Hewitt, Sacha DeAlwis, Shane Cato, Vincent Ebanks, Zachary McLaughlin. Ricardo Sealy (manager), Theo Cuffy (coach), Andy Myles (assistant coach). The Honolulu Cricket Club is arriving tonight and we are asking for your support to help fund a dinner at the Pavillion after Saturdays game. $20.00 dollars a head will provide each team member with food and drink. Please come out for some fine cricket and help us provide the hospitality needed for this event. The Matches will take place Tuesday at Shawnigan Lake 14th, Thursday 16th and Saturday 18th at Beacon Hill Park. Canada faces a stiff challenge from Bermuda in its bid to return to the ICC U/19 Cricket World Cup when the five-team round-robin Americas U/19 Qualifier begins at Mapleleaf CC, King City in Toronto from Monday. Argentina, the Caymans Islands and debutants Bahamas are the other teams taking part in the week-long competition. The winner will join the ICC’s 10 Full Members, hosts Malaysia, and Papua New Guinea and Ireland (which recently qualified from the East-Asia Pacific and European Regions respectively) at the 16-team ICC U/19 Cricket World Cup to be played from 17 February to 2 March 2008 in Malaysia. Canada missed the 2006 event in Sri Lanka but participated in the 2002 and 2004 ICC U/19 Cricket World Cups in New Zealand and Bangladesh respectively. Familiar home conditions, an improving infrastructure and more international exposure helps Canada to start as firm favourites and coach Courtney Gonsalves is optimistic that his players are ready for the event. He said: “All the players attended the elite programme we started last October in which we set up talent hunt and training camps throughout Canada. However, Canada is likely to be tested by Bermuda which has been bolstered by the inclusion of all-rounders Malachi Jones and Stefan Kelly, who participated in the ICC Cricket World Cup 2007 in the West Indies while the youngsters' captain Rodney Trott narrowly missed the Caribbean tour. The trio will rejoin the senior Bermuda team for the match against Ireland in the ICC Intercontinental Cup after completing the Toronto assignment. Bermuda prepared for the tournament by playing eight domestic 50-overs-a-side competition matches between May and June besides participating in the Sir Garfield Sobers Cricket Tournament in Barbados which was also used as a training camp for the Americas U/19 Qualifier. “We have worked tirelessly on the team concept, and the individual discipline of the players have really improved. Our team this year is mentally stronger (than previously) and combined with the intense training the players received from the coaches, this should result in a good team combination. The players have the knowledge and now they need to produce,” said Manders. For Argentina, it will be its first appearance in this event as an ICC Associate Member. It has previously struggled at the junior level but it would be dangerous to discount the South Americans, particularly after the senior team’s heroics in Darwin in June where it earned promotion to Div. 2 by qualifying for the final of the ICC World Cricket League Div. 3. Barton said the sport is still in the embryonic stage in Argentina and the team has prepared as best it can in the tough winter season. “The players are very much in the development stage and we are aiming to do the basics right and achieve our specific goals for each skill area, the experience and exposure to international cricket. “The team has prepared as best it could as it is winter in Argentina at the moment and training has been extremely difficult at times. But the team has trained well and the development of the players over the last three months has been very pleasing,” Barton said. The Caymans Islands has always been very competitive at youth level and nobody is expecting it to be far behind this time. Captain Ramon Sealy, along with top-order batsman Darren Cato and bowler Kervin Ebanks have played in the Caymans Islands domestic Division 1 tournaments for the last two years. Bahamas is the only Affiliate Member in the group and is fielding a team for the first time. The senior team will participate in next year’s ICC World Cricket League Div. 5 to be played in Jersey in May. Taylor said playing age-group cricket is a new development for the Bahamas. “Two years ago we did not have a full U/19 team, but we worked hard under the guidance of coach John Welch to achieve this. “Jonathan Barry, Jeremy Jesubatham, Rodrick Mitchel and I came up in the U/15 program from 2001 and have played a lot of cricket with the seniors,” Taylor said. The United States of America (USA), which took part in its first ICC U/19 Cricket World Cup in Sri Lanka in 2006 and beat Namibia, is absent from the qualifier because it is currently suspended as an ICC Member. Juan Tomas Birnie (captain), Alejo Tissera, Augusto Mustafa, Facundo Duggan, Hernan Fennell, Horacio Esperon, Ignacio Fermani, Ignacio Redruello, Juan Pablo Bordacahar, Pablo Siracusa, Pedro Bruno, Ramiro Rodriguez Delgado, Santiago Iritxity Irigoyen, Santiago Paez Nicoletti. Christian Tunon (manager), Hamish Barton (coach) and Esteban MacDermott (assistant coach). Gregory Taylor (captain), Adrian Dean, Ambry Moss, Anwar Sawyer, Corie Frazer, Franz Taylor, Fritz Stubbs, Jeremy Jesubatham, Jermaine Adderley, Jonathan Barry, LaSalle Thompson, Marc Taylor, Rodrick Mitchel, Rudolph Fox. Paul Thompson (manager) and John Welch (coach). Rodney Trott (captain), Christopher Douglas, Dennico Hollis, Greg Maybury, Hodsoll Kyle, Jordan De Silva, Khiry Furbert, Lamar Richardson, Malachi Jones, Marico Bassett, Stefan Kelly, Steven Bremar Jr, Tamauri Tucker, Terryne Fray. Gerald Bean (manager), Arnold Manders (coach), Andre Manders and Cleveland Wade (assistant coaches). Abishek Krisnamoorthy (captain), Chris Monohar (vice-captain), Arsalan Qadir, Asif Manjra, Hasan Raza Zaidi, Jaskeerat Singh Kalon, Kevin James, Khushal Gangopadhyay, Majid Usman, Pratik Patel, Riayzkhan Pathan, Rustum Bhatti, Ruvindu Gunasekera, Usman Iqubal. Wijay Senathirajah (manager), Courtney Gonsalves (coach) and Dan Keisel (Physio). Ramon Sealy (captain), Corey Cato, Dale Parker, Darado Thompson, Darren Cato, Earl Hart, Kervin Ebanks, Patrick McConvey, Robert Hewitt, Sacha DeAlwis, Shane Cato, Vincent Ebanks, Zachary McLaughlin. Ricardo Sealy (manager), Theo Cuffy (coach), Andy Myles (assistant coach). The ICC U/19 Cricket World Cup is a vital part of the ICC Development Program and provides a vehicle for the best young cricketers in the world to parade their skills. Many of the future stars of the game experience their first true international exposure at this tournament and players such as Brian Lara, Michael Atherton, Yuvraj Singh, Inzamam-ul-Haq, Chris Cairns, Michael Clarke, Graeme Smith and Sanath Jayasuriya have used the event as a stepping stone to full international honours. First staged in Australia in 1988, the tournament was initially organised on an occasional basis, but since the commencement of the ICC Development Program in 1997 it has become a biennial fixture. The 2010 ICC U/19 Cricket World Cup will be held in Kenya while the 2012 tournament will be staged in Canada and UAE will host the 2014 edition. Canada have named a 14-man squad for next week's Americas Under-19 regional tournament. They and Bermuda are expected to battle for the World Cup spot at stake. Thirteen of the players, including the captain Abishek Krishnamoorthy, are from Ontario, as is vice-captain Khrishna (Chris) Monohar. Jaskeerat Khalon from Alberta is the other member of the squad. Courtney Gonsalves has been coaching the players, assisted by Abdul Majeed and Pubudu Dassanayake. Most have trained in the Greater Toronto Area over the last two weeks, with Maple Leaf CC providing facilities. Admission is free for all matches. Barry Ganese hit the cricketing maximum on Friday (August 10), powering to six sixes in one over of six balls. Ganese was playing for Toronto and District Premier club Overseas against the touring Trinidad and Tobago club side Powergen at Maple Leaf CC, King City, Ontario. He continued to score freely and took his side to victory with an individual score of 80 runs not out from a mere 30 balls. Ganese said 'First time (to hit six sixes in an over). I've had close encounters before with 4's and 5's but first time for six sixes. It was a big thrill out there. It was especially good to have family and friends - a lot of friends- around to see it.” He even said a few of his overall ten sixes were mishits! Powergen scored 264 runs all out, with Sherwin Ganga making 125 runs and Denzil James 57 runs. Young pace bowler Usman Limbada took 4 wickets for 45 runs. Overseas made 268 runs for 5 wickets. Sandeep Jyoti with 72 runs and Kevin James 61 runs had a major partnership that formed a solid base for the eventual win. Powergen's enterprising trip to the Greater Toronto Area ends with 4 wins and 2 losses, but more importantly are the prospects of further cricketing exchanges between Canada and Trinidad to help the game flourish, and to bring people together in the right spirit. Background Note: Six sixes in an over provoked memories of this achievement in matches at the higher levels of cricket amongst many at the ground on Friday. The great Gary (now Sir Garfield) Sobers was the first player to hit six sixes in an over in first class cricket. He did this at Swansea in 1968. Glamorgan's Malcolm Nash. Indian international Ravi Shastri hit six sixes off Tilak Raj in a Ranji Trophy match during the 1984-5 season. South Africa's Herschelle Gibbs became the first player to hit six sixes in a One-Day International during the Cricket World Cup 2007 match against the Netherlands. Daan van Bunge was the bowler. Malcolm Nash is believed to reside in Canada. No matter the efforts to have him play cricket, or attend banquets, Nash has never accepted an opportunity to reminisce about the power of Gary Sobers batting. (JH). Without a CCA sponsored interprovincial tournament this year the Manitoba Cricket Association decided to hold a Western Canadian Senior Invitational tournament. round robin tournament was held from August 4 to August 7 at Assiniboine Park in Winnipeg Manitoba. the result was inevitable and Manitoba got a deserved win. Cottrell made the necessary breakthrough and Murray Reed finished off the tail with an impressive five wickets. Saskatchwan only posted 124,but B.C. struggled to adapt to the matting wickets and lost 5 wickets in the chase, David McGowan top scoring with 40.
contributing. Saskatchewan had no real answer to that type of total and crumbled to 117 all out, Sreetham picking up four wickets for 11. In the western grudge match B.C. won the toss and elected to bat. Despite the early loss of Dixon the second wicket of McGowan and Jason Sandher created a solid platform for an assault from the middle order. of scoring shots and despite batting for 44.3 overs they managed only the 97 runs, Andrew Downs with two wickets and Kevin Sandher with three were the pick of the B.C. bowlers. but Jason Sandher and Richard Hawes batted expertly to knock of the remaining runs, despite a few rain showers. Hawes 58 not out and Sandher 54 not out. Thapliyal took advantage of some wayward Manitoba bowling to post fifties and bring the game home. Alberta by six wickets. Jason Sandher and Dixon got to within sight of the Manitoba total. Jason Sandher top scoring with 65 in an 8 wicket B.C. win. early wickets but Nair and Persaud steadied the ship with thirties to bring up a five wicket win for the westerners. this is a preview for next summer's interprovincial tournament which will be held in either Alberta or Ontario. consider perhaps? Kevin Sandher and Steve Welsh confirmed their quality, while Zain Ahmed, another recent Canadian selection, looked troubled by the superior B.C. bowling. Ajay Minhas scored a century but with his Toronto CC teammates mostly floundering, he ended up on the losing side against Trinidad’s Powergen. Minhas made 104 runs (10x4, 1x6) out of 168 runs for 9 wickets in 40 overs. He arrived at the crease with the score on 6 runs for 2 wickets. Two more wickets fell in adding just a single. Home skipper Akshay Bagai helped put some respectability on the scoreboard, before falling for 20 runs to make the total 62 runs for 5 wickets. The total squeezed past 100 before Viren Patel was out for 13 runs. The rest was mostly Minhas. He was ninth out, two runs short of the closing total. Powergen captain Samuel Badree took 3 early wickets and ended with 5 wickets for 22 runs from his eight overs, including the wicket of Minhas. The visitors’ reply benefited from several wides and loose deliveries, but Toronto managed a couple of breakthroughs. Jason Mohammed, batting at number three, proved to be the mainstay. He helped move the score from 32 runs for 1 wicket in the sixth over to victory in the 33rd over. His personal contribution was 76 runs not out, including 9 boundaries and a six. Toronto missed some catching chances in a mixed bag of fielding. Some was good, but other mistakes saw balls pass fielders for vital runs, sometimes a boundary when no run should have been made. Still, this was a youthful Toronto side and the experience should be useful for the future. Bagai took 3 wickets for 31 runs in eight overs, that helped steady the Powergen scoring rate. The experienced Sherwin Ganga (19 runs) and Brent Harriot (18 runs not out) provided enough support for Jason Mohammed to post a 4 wicket win. Powergen close the cricket-playing aspect of the trip to the Greater Toronto on Friday with a match against Overseas CC at Maple Leaf CC, King City. The Trinidadians are looking forward to this encounter and, hopefully, the game will see a reasonable crowd turn out. Hopefully this marks the start of a greater relationship with Trinidad and Tobago, as was raised in post-game speeches after last Friday’s match with Brampton Masters. The final game is due to begin at 1 pm. Powergen has taken in some of the 40th Caribana festival. Let’s hope for a festival of cricket to end this most welcome tour. Veteran Ave Mogan (Ontario) has been named captain of Canada’s women’s cricket squad for the Americas Regional Tournament being played between August 20 and 24. Kim Coulter (British Columbia) is the vice-captain. The games are at Maple Leaf Cricket Club, King City, Ontario. A Trinidad and Tobago side heads the participants, with Bermuda and Argentina completing the four-team line-up. Bermuda qualified for the next stages of the women’s world cup by beating Canada 2 games to 1 last September. Tony Cordle, a stalwart of Glamorgan cricket in the County Championship, has been named coach. Eight members of the squad are from British Columbia, the other six from Ontario. Canada open against Trinidad & Tobago on Monday August 20), plays Argentina next day and completes its schedule against Bermuda on Wednesday August 23. The Trinidad & Tobago side meets an Americas XI on Friday August 24, with remaining players appearing in a Rest of Americas “A” v “B” match. Admission is free. Ave Mogan (captain), Janet John-Doree, Monali Patel, Mona Persaud, Yvette Singh, and Vadeo Sproxton. Kim Coulter (vice-captain), Claire Abbott, Chelsea Baker, Meara Crawford, Shelley Fathers, Helene Gaffney, Joanna White, and Maree Wilson. The Canadian squad has been named for next week’s ICC Americas Under19 Regional tournament. Most of the 21-players in the original Under-19 have trained and practiced in the Greater Toronto Area over the last two weeks, thanks to assistance from the Maple Leaf Cricket Club in providing facilities and various parents in providing lunches. The squad includes 13 players from Ontario with an emphasis on players from the Toronto and District Cricket Association (T&DCA). Jaskeerat Khalon from Alberta is the other member of the squad. Abishek Krishnamoorthy (Overseas CC, T&DCA) has been named captain, with Khrishna (Chris) Monohar (Cavaliers CC, T&DCA) as vice-captain. Courtney Gonsalves has been coaching the squad, assisted by Abdul Majeed and Pubudu Dassanayake. The team lost to Brampton Masters, playing under the Under-23 colours in the T&DCA Premier Division, and lost to the touring Trinidadian leading club team Powergen on Tuesday (August 7). Canada plays Argentina (Aug 14), Bahamas (Aug 16), Cayman Islands (Aug 17) and Bermuda (Aug 18) in this junior tournament. Canada and Bermuda would be expected to battle for the World Cup spot, being the two ICC High Performance countries in this tournament. The USA won the qualifier two years ago but the US Cricket Association is under suspension by the ICC due to administrative issues. Khusal Gangopadhyay (Malton, RHB, RM); Alberta-based player: Jaskeerat Khalon (-). LBG = right arm leg-breaks and googlies. I interviewed each of the players I met at different training sessions to obtain details on clubs, batting and bowling style. Powergen, a leading club from Trinidad and Tobago, beat the Canadian Under 19's by 5 wickets at G. Ross Lord Park on Tuesday. The Under 19's won the toss on a day of grey skies and batted first. The bulk of the Canadian scoring came from the lower middle order. Riyazkhan Pathan and Pratik Patel each scored 28 runs. Kevin James hit some powerful shots to reach 30 runs not out off just 12 balls. He straight drove for four then powered the final ball of the 30 overs to deep midwicket for six. Three of the seven wickets that Canada lost came from run outs. The visitors lost an early wicket, but batted solidly. Young opening bat Nicholas Sookdeosingh made 28 runs, Sherwin Ganga and Danzel James powered his way to 54 runs. He included two consecutive sixes to take the total past the 100 run mark and, as the target approached, straight drove for six and four. It was a very useful match for the young Canadians who play in the Americas Regional qualification for the Under-19 next week at Maple Leaf CC. Powergen had an eight wicket win over the Cayman Islands Under-19s in Trinidad in early July. Bermuda, Argentina and Bahamas are the other sides in next week's qualifier. One spot is available for the World Cup in Kuala Lumpur next February. Powergen face Toronto CC at the Toronto Cricket Skating and Curling Club on Thursday and close the playing schedule with a game at Maple Leaf CC on Friday against Overseas CC. Both Toronto and Overseas are Toronto and District Premier teams. *** On Monday, Powergen beat the Ontario Cricket Association XI at Maple Leaf CC. Powergen made 262 runs for 9 wickets in 40 overs. Sherwin Ganga top-scored with 55 runs and then took 4 wickets for 50 runs. Powergen skipper Samuel Badree made 46 runs. Rochel Mehta, bowling for the OCA XI, took 4 wickets for 36 runs. Arvind Kandappa topped the OCA XI batting with 64 runs. "This booklet represents the first attempt to record the statistics for a full season of Canadian cricket. It has been possible to do this due to the excellent co-operation of league and club secretaries. We hope that the publicatrion of this booklet ar the begining of the 1959 season, during which an M.C.C. team will be touring Canada, will encourage clubs and leagues to keep even better records in order that this piblication may be issued annually". Whereas it is known that a body known as the Canadian Cricket Association was, in fact, in existence, durring the latter half of the last century (1800's), very little is known about the activisities and scope of this organization, who its officers may have been or where its headquarters was located. It is known, however, that Canadain Teams were selected to participate in certain tours as witness the visit to England of a Canadian side in 1880: another under the title Gentlemen of Canada in 1887: a third known as Canadian Zingari in 1910: a fourth sponsored by Norman Seagram of Toronto in 1922, and what amounteed to the first really representative Canadian Team, which was taken to England in 1936 by the Honorable R.C. Matthews of Toronto. By virtue of the fact that Mr. Matthews' team was the first one of its kind to include players from Western Canada it was, altho not in name, certainly a representative side. The success which attended the efforts of this team abroad no doubt contributed in large measure to the decalared intent, upon their return, to form a body representative of and entitled to speak for all Canadian cricketers engaged in any international match or tour abroad. First steps in this direction had been taken, in fact, two years before Mr. Matthews' Team visited England as, in 1934, at a meeting of the Ontario Cricket Association in Toronto, a proposal that a Dominion Body should be created was put to the meeeting and accepted in principle. Later in that year, a body known as the Dominion Cricket Advisory Board, under the Chairmonship of the Hon. R.C. Matthews was set up. Due to the work contributed by the members of this Board, who were drawn from Vancouver, Regina, and Montreal, to assists Mr. Matthews, the MCC toured Canada from coast to coast in 1937. It was partly as a result of a series of recommendations made by members of this MCC side that plans were pushed forward to create a Canadain Cricket Association and to prepare a constitution to which all Canadain cricket organisations would be asked to subscribe. The original constitution was adopted in 1940 after having been revised and tailored to meet the needs of the situation as it then appeared. Owing to the natural division of Eastern and Western Canada and the considered necessity of having bodies which would be able to deal with matters which were deemed to effect one part of the country but not the other, Regional Boards were set up. No sooner had the constitution been adopted than cricket matters bogged down owing to the all consuming demands on time and personnel dictated by the Second World War. At the close of hostilities steps were taken, as quickly as proved practical, to review cricket on a nation wide scale anbs in 1947 the first Iter-Provincial Tournamnet was held in Toronto. Team from British Columbia, the Prairie Provinses, Ontario, and Quebec participated, and the tournament was considered such an outstanding success that plans were made for its continuation. It was as a result of the success of this tournament that certain defects became apparent in the constitution and a series of discussions took place in Toronto in August, 1947, with a view of promoting cricket on a national basis in the future It was decided, as an upshot of the discussions held, to dispense with Regional Boards and to have a representative named by eack Cricketing Province to the board of Control of the Canadian cricket Association which, itself, would have a Chairman, Secretary, and Treasurer. This revised set up was written into the constitution and the present form may be said to date from the formal adoption of the revised constitution on 29th July, 1949. "Cricket coaching has come a long way in the past couple of generation. Players used to rely on natural ability and would practise their skills sporadically. Teams didn't have coaches. Instead, players relied on each other to impast technichal tips on playing the game. But in the modern era players have all sorts of professional backroom staff to call on. The top professional teams such as those representing counties and nations now have fitness trainers, dieticians, sports psychologists, and speciatist coaches who are experts in one facet of the game such as fielding, batting or bowling. Cricket coaching may be a relatively modern phenomenon but tactics have always played a big role in the game. The team captain has to decide the tactics, and the challenges facing the captain differ according to whether the team is batting or on the field." Toronto (Aug 3): Brampton Masters tallied a historic 26-run win over Trinidadian club Powergen at Eglinton Flats, Toronto. Masters made 232 runs for the loss of 8 wickets in 40 overs, then dismissed Powergen for 206 runs (39.4 overs). Opening bat Arnul Gopie played several memorable strokes and gained an early advantage for Masters. Gopie went on to make 71 runs. Nazar Saad contributed 54 runs. Sherwin Ganga took 3 wickets for 30 runs. Canadian international Henry Osinde took two early wickets, despite some fine early shots from young Nicholas Sookdeosingh's. The youngster was caught by wicketkeeper Gopie for 16 runs. Eight Powergen players reached double-figures, but Masters managed to contain the scoring. Osinde ended with 3 wickets for 30 runs. Rishi Bachan and Rhondel Ramlochan each scored 37 runs for the visitors. The Canadian Cricket Association (CCA) is the overall controlling body of cricket in Canada, both domestically and internationally. Its members are the Provincial Cricket Associations of provinces where cricket is played. One of those member Associations is the Ontario Cricket Association (OCA). The Canadian Cricket Association initiated, and submitted to the Ontario Provincial Government, an application for funding in the amount of $150,000. This sum was intended for a defined project to improve a major cricket facility located in King City, Ontario. That facility is used extensively by Ontario-based cricketers; it is also used for inter-provincial and international cricket. All funds provided as a result of that request were directed to the Ontario Cricket Association (OCA), the body responsible for cricket in the province of Ontario. The CCA received no funding whatsoever from the Ontario Government, either for that specific project or any other project. For decades, Ontario has been the hub of cricket in Canada and the province contains by far the largest number of cricket players of all ages and both genders. The CCA fully supports the Ontario Cricket Association in its endeavours to secure funding from both the public and private sectors in order to allow the sport to continue to flourish in the province. The Canadian Cricket Association has been in existence since 1892. It operates in a financially prudent and totally transparent manner. The CCA produces a fully audited set of financial statements which are submitted annually to the Federal Government of Canada. It is generally recognized that cricket is one of the fastest growing sports in Canada. This is occurring for several reasons. Firstly, the growth in immigration in recent years from South Asia has fueled a consequent growth in the number of cricketers both in Ontario and across the country. Secondly, the performance of the Canadian national team at the ICC Cricket World Cups in 2003 and 2007 has given greatly increased visibility to the sport and provided role models to which younger cricketers may aspire. Toronto (August 2): PowerGen (Carib Beer National League, Trinidad & Tobago) stormed to victory by 7 wickets over Tranzac (1st Division, Toronto & District Cricket Association - T&DCA) on Thursday. Tranzac made 165 runs for the loss of 8 wickets in 40 overs at Toronto's Eglinton Flats. Deokie top scored for Tranzac with 32 runs (1x4, 1x6), adding 52 runs for the second wicket with Kushul Mehta (14 runs). Talented young opening batsman Nicholas Sookdeosingh lead the PowerGen charge with 60 runs. His knock included 4 boundaries and three six hits. Sherwin Ganga helped the youngster add 132 runs for the second wicket. Ganga went on to make 71 runs. He survived two or three missed catches, but crowned his innings with three mighty sixes on top of nine boundaries. Ganga had earlier picked up 2 wickets for 24 runs in bowling 8 overs when Tranzac was batting. The one PowerGen player to struggle was opening bowler Kyrone Gopie. He had problems with the uneven run-ups to the matting wicket, bowling several wides and a no-ball enroute to conceding 19 runs in just 1 over. The tourists will hope this winning start sets the trend for remaining matches in the Greater Toronto Area (GTA). Matches remain with T&DCA Premier clubs Brampton Masters (Fri Aug 3, Eglinton Flats), Cavaliers (Tues Aug 7, G. Ross Lord Park), Toronto CC (Thurs Aug 9, Toronto Cricket Skating & Curling Club) and Overseas (Fri Aug 10, Maple Leaf CC, King City). Each of these matches begins at 1 pm. PowerGen faces an Ontario Cricket Association XI at Maple Leaf CC, King City on Monday Aug 6 at 11 am. Admission is free at all matches. The Canadian Cricket Association have announced their final Under 19 squad for the Americas qualifying tournament in two weeks time. It consists of 13 players from the Toronto area, and a single Albertan. Given the number of players in BC it is somewhat surprising to see no representation from there.